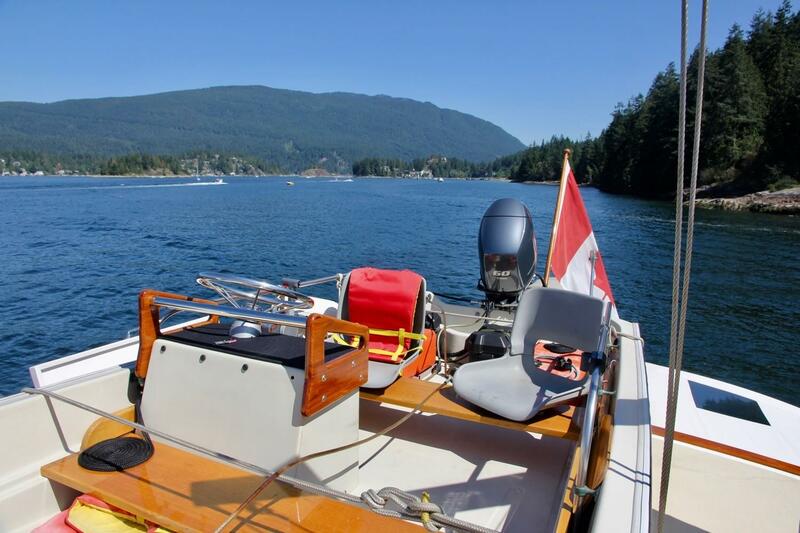 Eagle Rock II was designed by Thornton Grenfell as custom ordered by a local Vancouver family, active and passionate RVYC members. 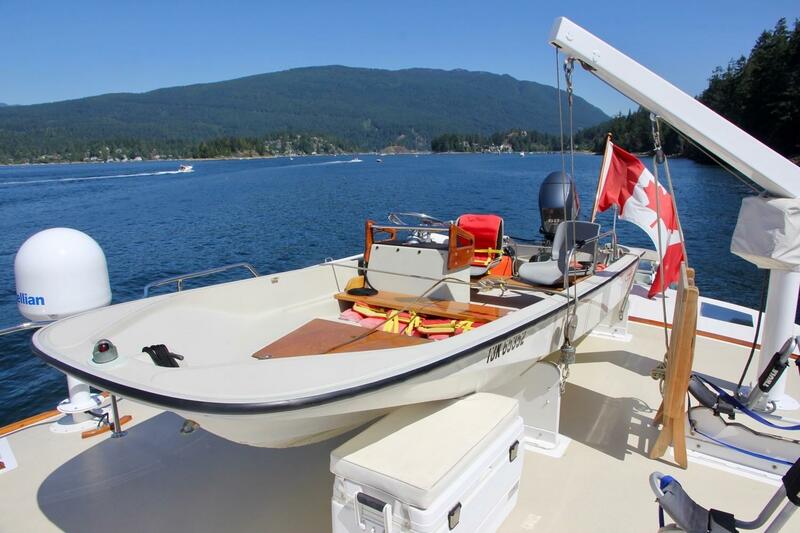 By the early 1970s, Grenfell had already long been established in British Columbia as a builder of strong cruising yachts with a distinctive design, known for beautiful styling, uncompromising construction, and impressive performance. Sadly, at the beginning of construction, Mr Grenfell passed away and his shipyard did not continue. 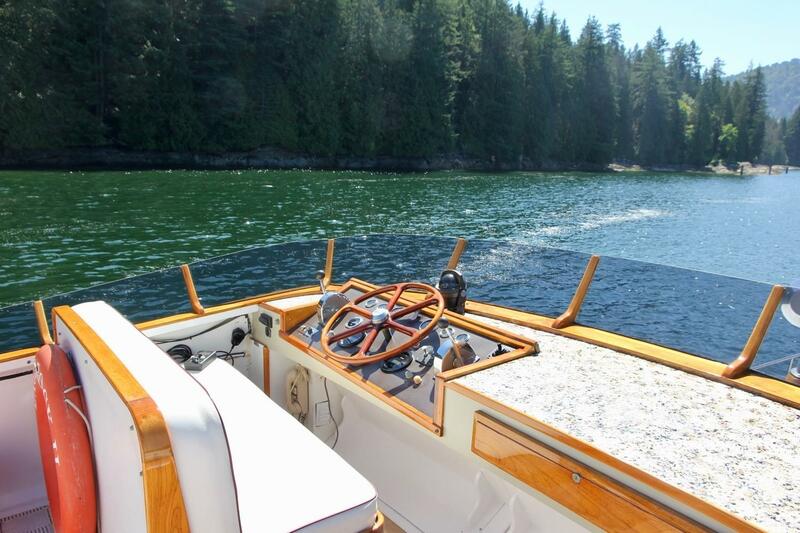 The ribs and frames were disassembled, and moved to the McQueen Boat Works shipyard where the yacht was finished. 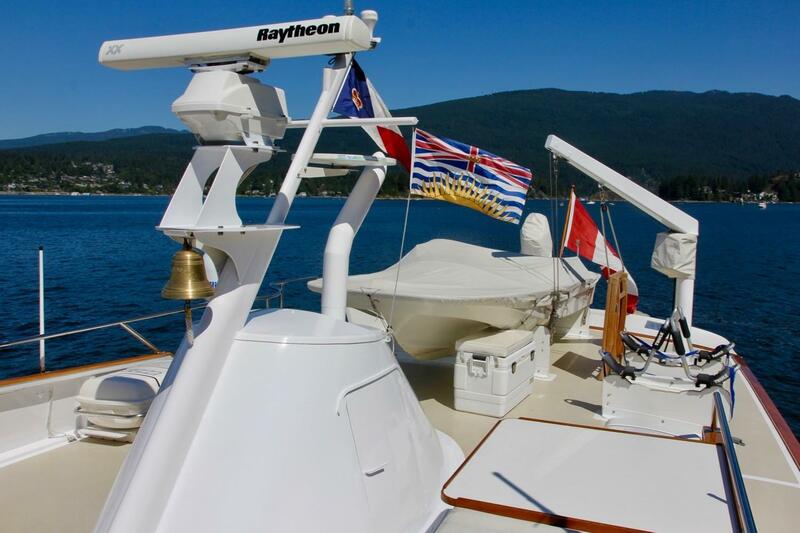 Upon completion, she was christened Nova Spirit, and based in Vancouver, she cruised with these first owners until 1980. 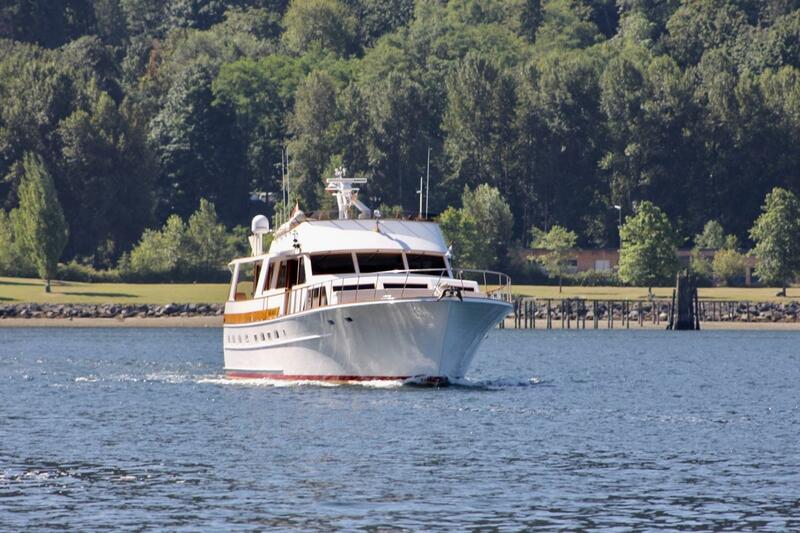 She was then purchased by another local yachtsman, and was renamed Nova Springs. 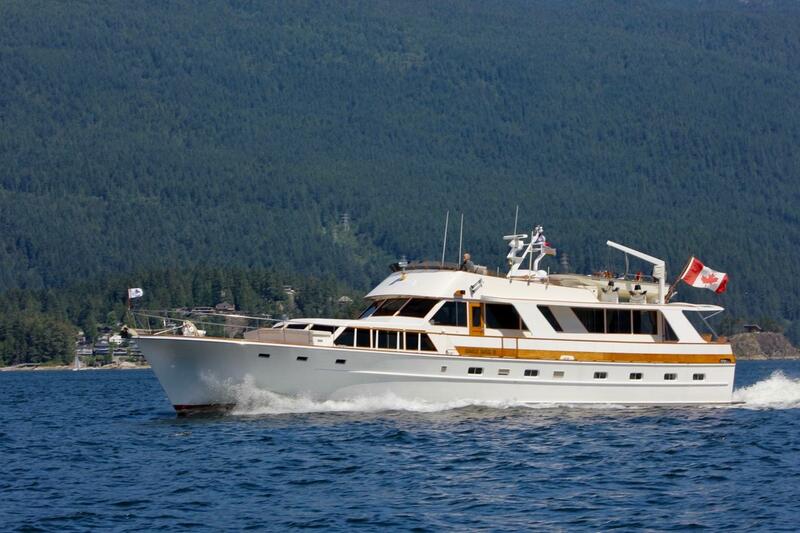 They owned Nova Springs until 1985 when she was sold to a Spokane family, who re-christened her Eagle Rock II. 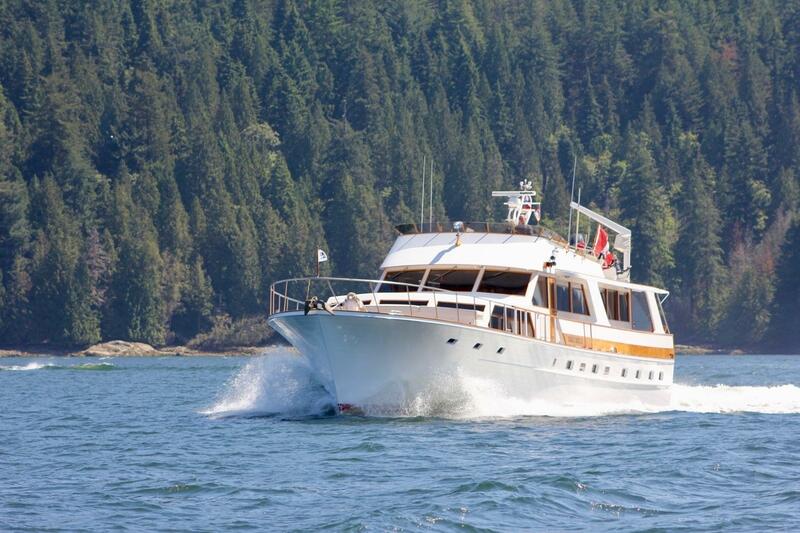 In 1989 she was purchased by these current owners and brought back to BC. 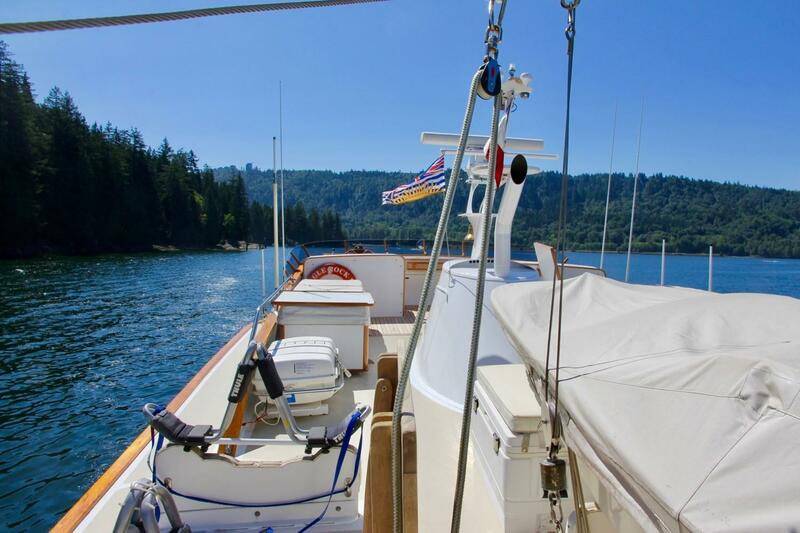 These current owners have thoroughly enjoyed Eagle Rock II as a family cruising yacht and entertaining platform for almost 30 years! 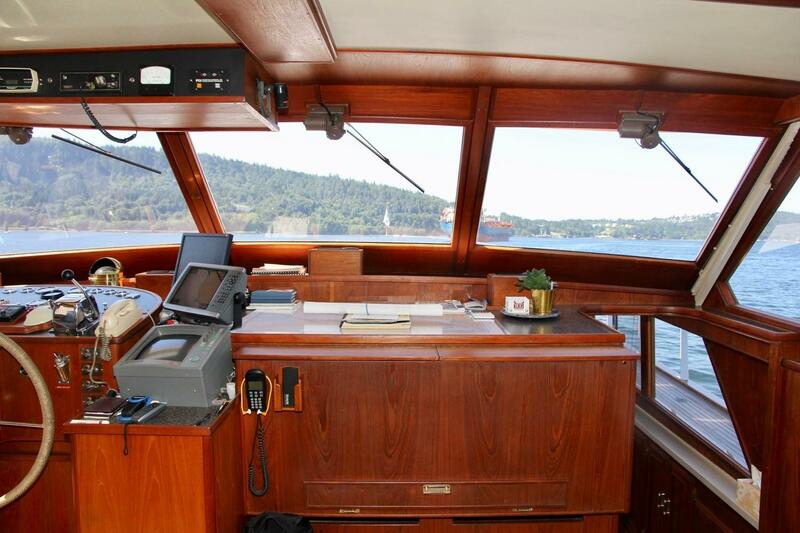 Their captain is dedicated, highly experienced, and boasts a wealth of knowledge and pride that is evident throughout the vessel. He has been Eagle Rock II's full-time operator and care giver for the past 22 years. 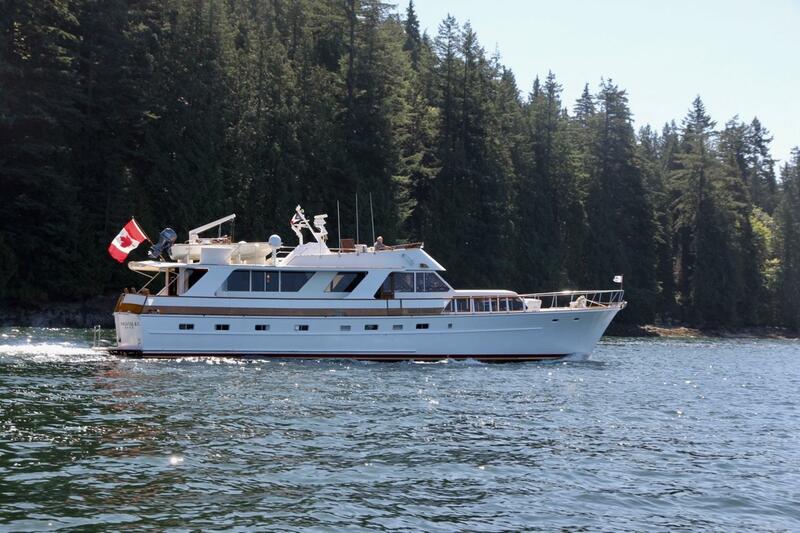 The owners have now purchased a new vessel, bringing Eagle Rock II to market. 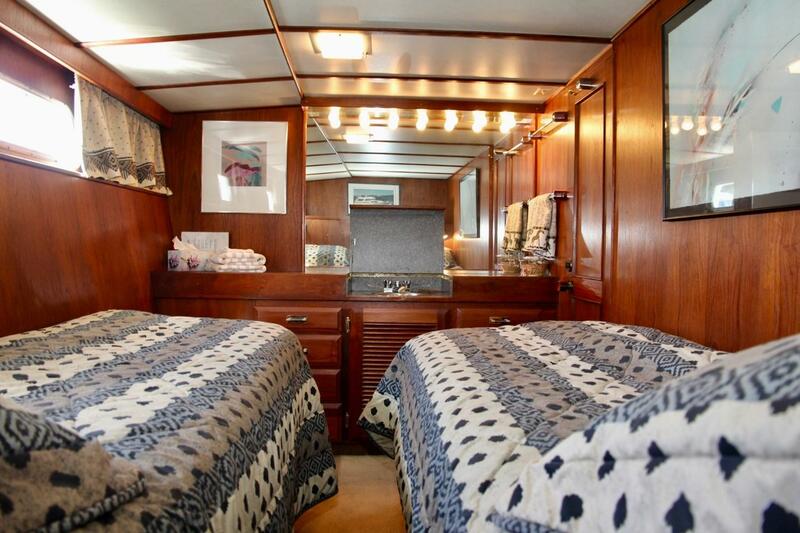 It is easy to see some Ed Monk influences in this flushdeck motor yacht: The general layout is similar, as is the profile. 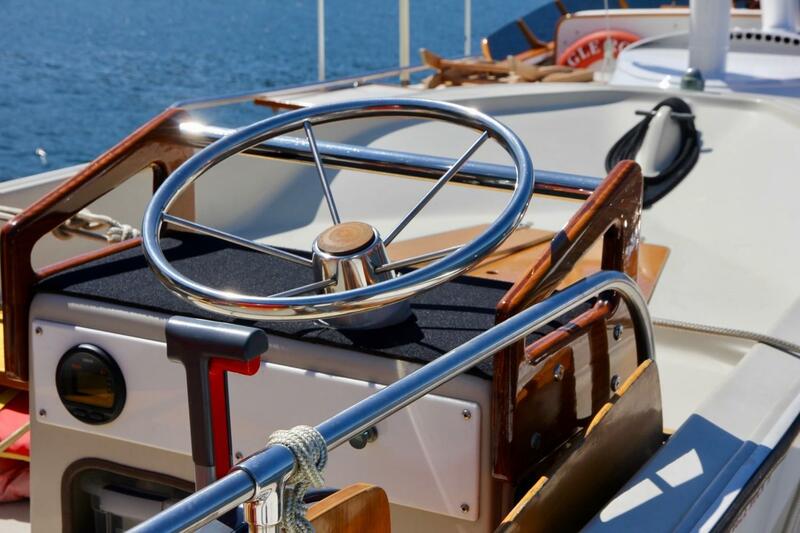 And during this time, throughout the 1970s, McQueen Boat Works were busy building Ed Monk's popular 72 foot series flush deck motor yachts. But this Grenfell is quite different. Most notably, the flared bow, distinctive to Grenfell; beautiful and stylish, and designed to provide a quieter, drier ride. 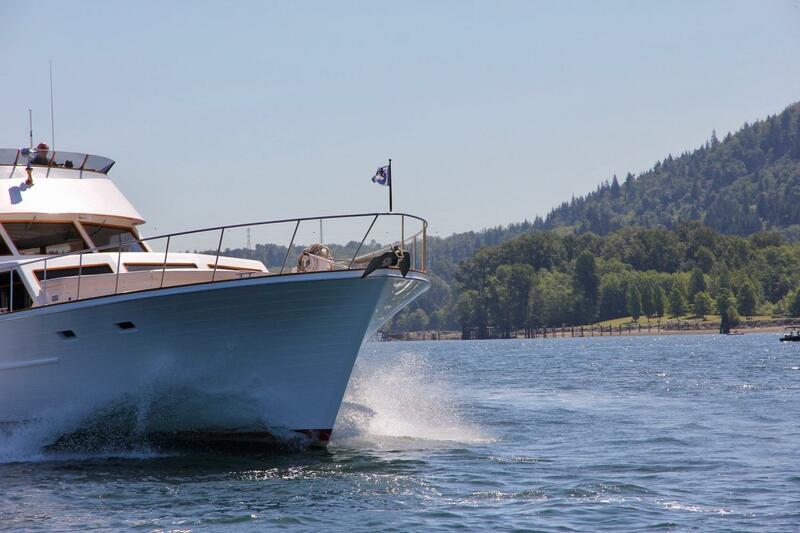 The exterior surfaces are in bristol condition with a gleaming hull, immaculate brightwork, and flawless teak decks. 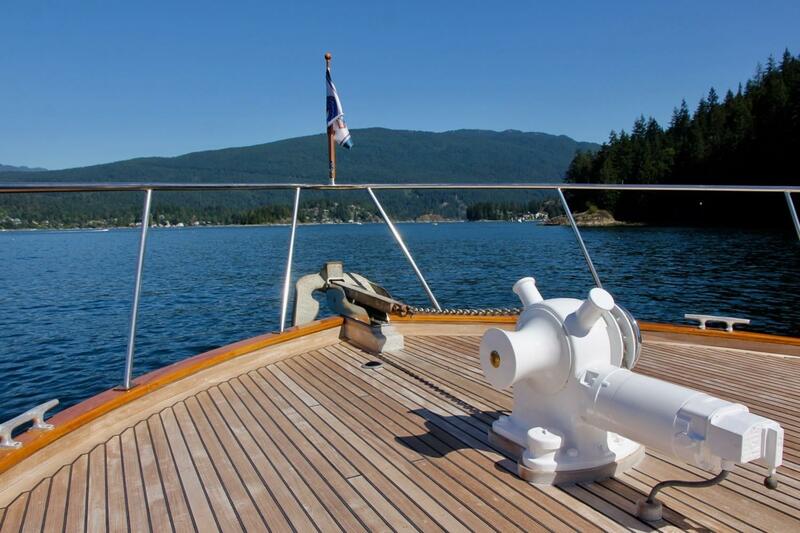 The decks are expansive and designed with safety and style in mind with wide side decks, high bulwarks, and stainless railings. 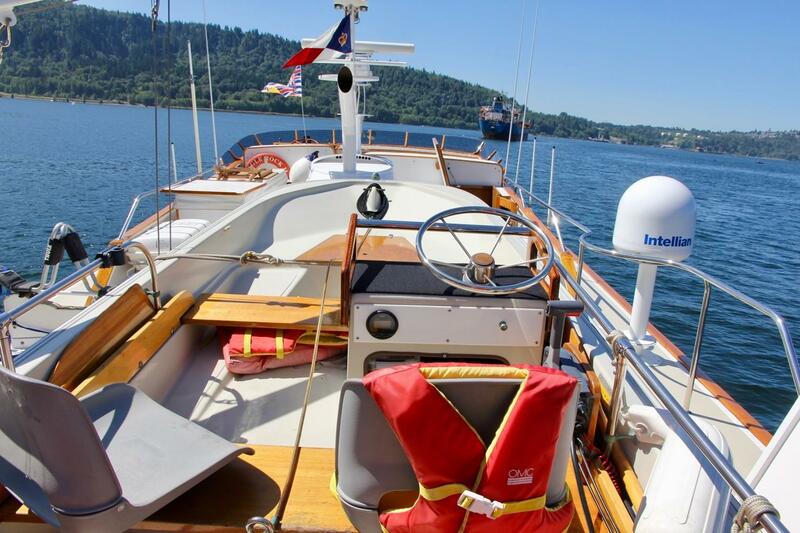 The interior is also pristine, with warm inviting spaces, broad carpeted floors, a perfect headliner, and impeccable teak joinery with a hand rubbed finish. 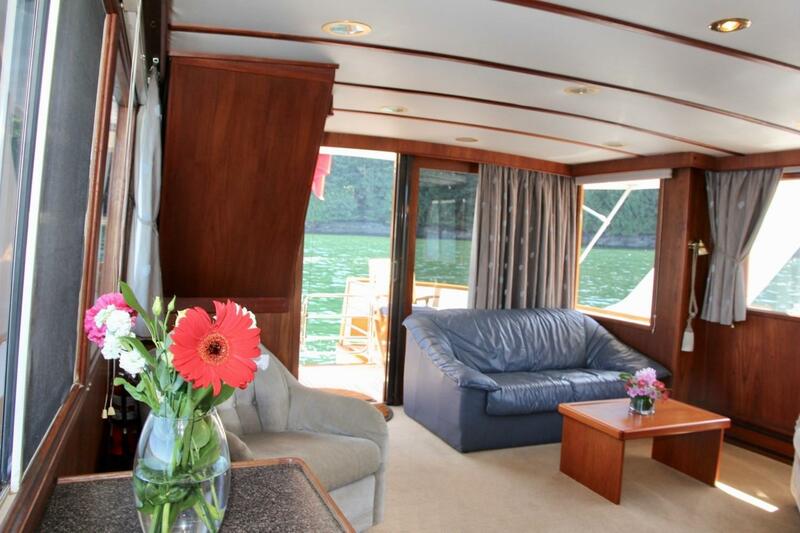 Eagle Rock II sleeps ten owners and guests in five cabins, or six owners and guests with room for up to four crew. 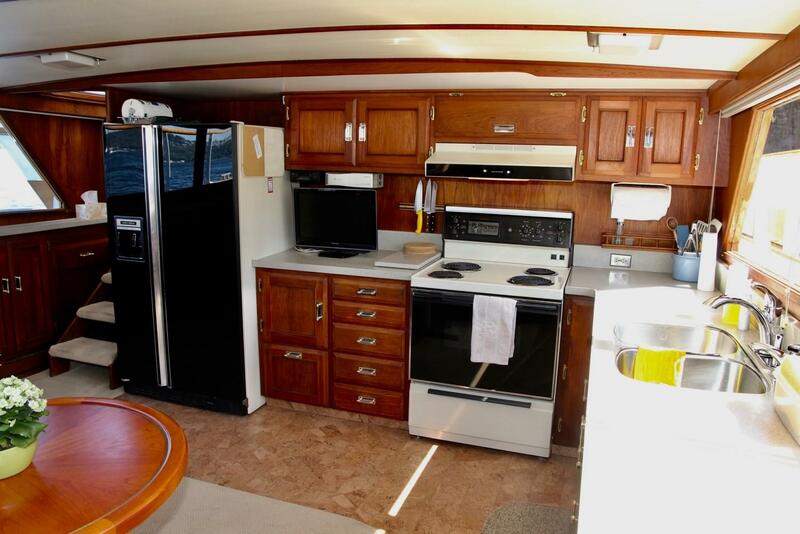 Eagle Rock II's spaces are more then comfortable, and six to eight guests can dine at the salon table. Twelve or more guests can be hosted to a sit down party, and even more for a more casual gathering where guests can mingle indoors and out. 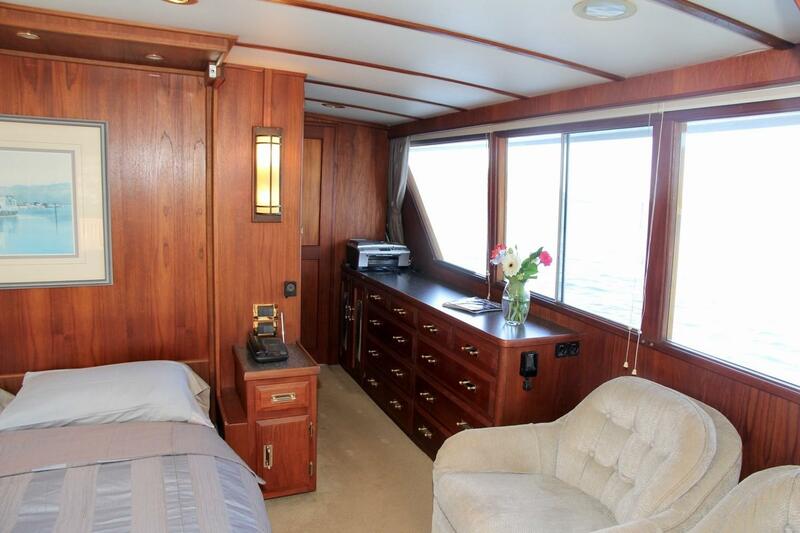 And the master stateroom doubles as a private day lounge. 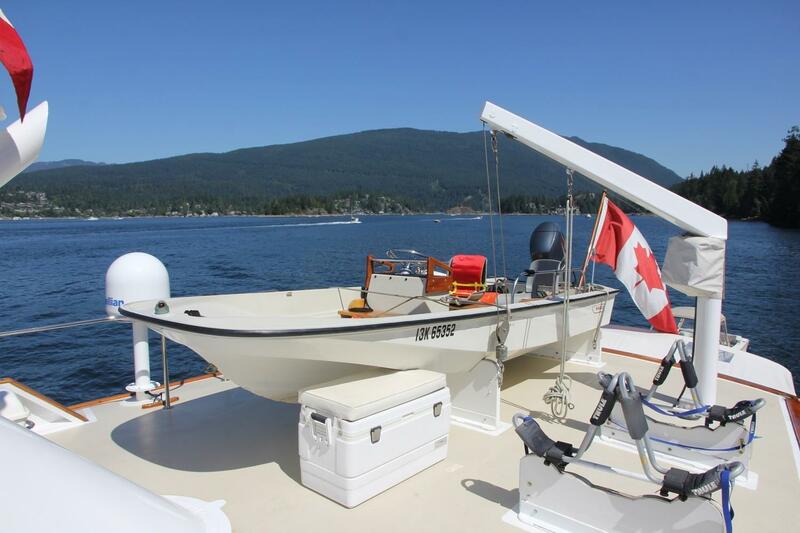 Board Eagle Rock II from the swim platform to the aft deck, or via the gates to the port or starboard side decks using the custom dock ladder. 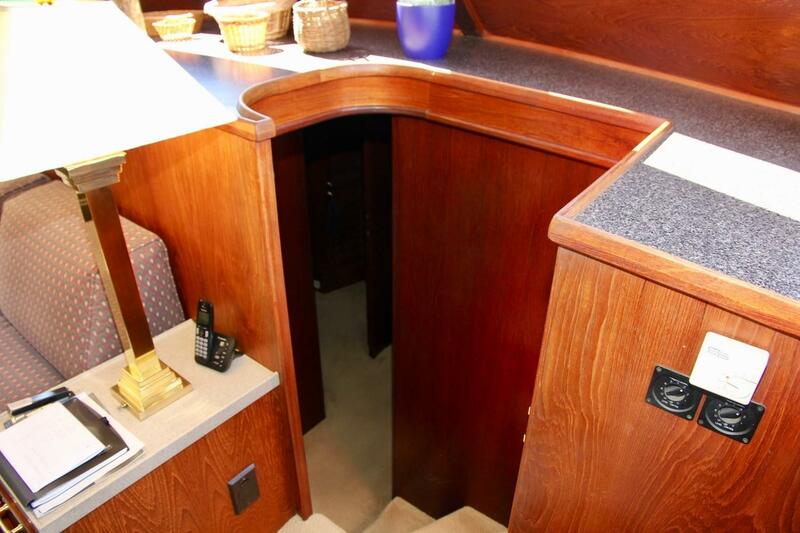 Gain the flybridge using one of two sets of stairs; one from the aft deck up to the boat deck, and the other from inside the salon to the flybridge. 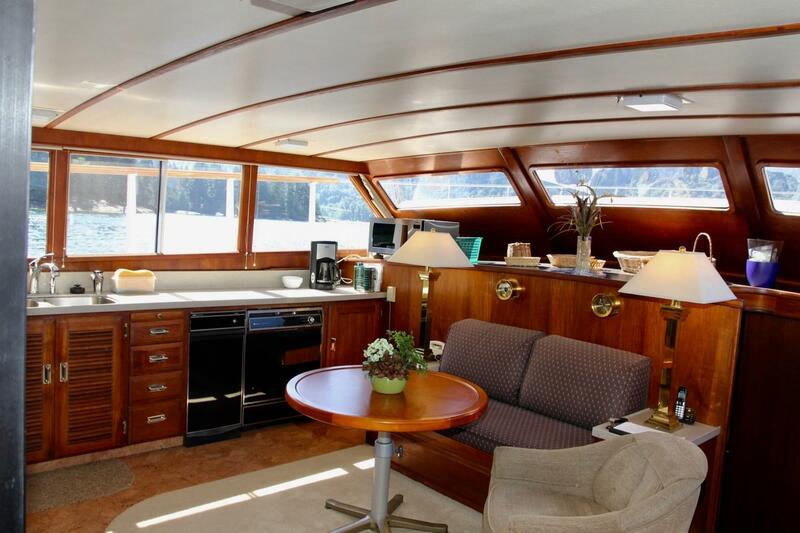 The main deck has a broad salon midships, with port and starboard doors to the side decks, master suite aft with a door to the aft deck, and lower helm forward. 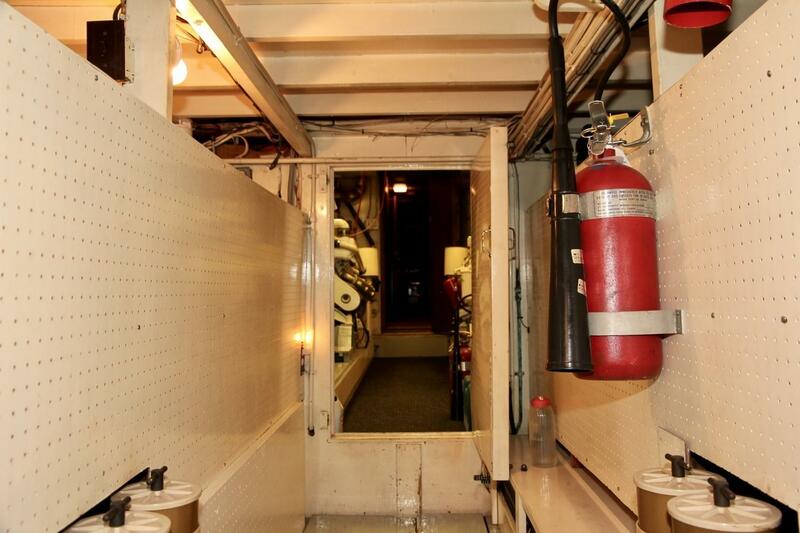 The galley is down three steps forward of the salon. 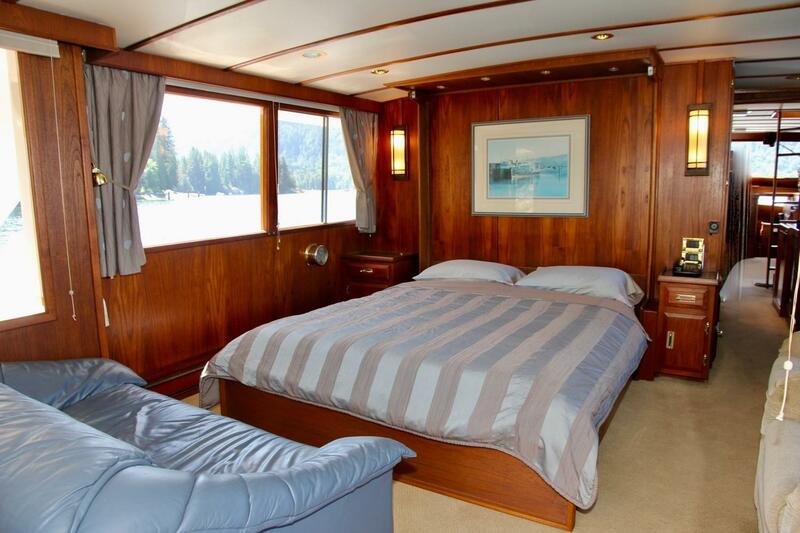 Below and aft, accessed via stairs from the salon, are two guest staterooms, two utility rooms and a guest / day head with stall shower. 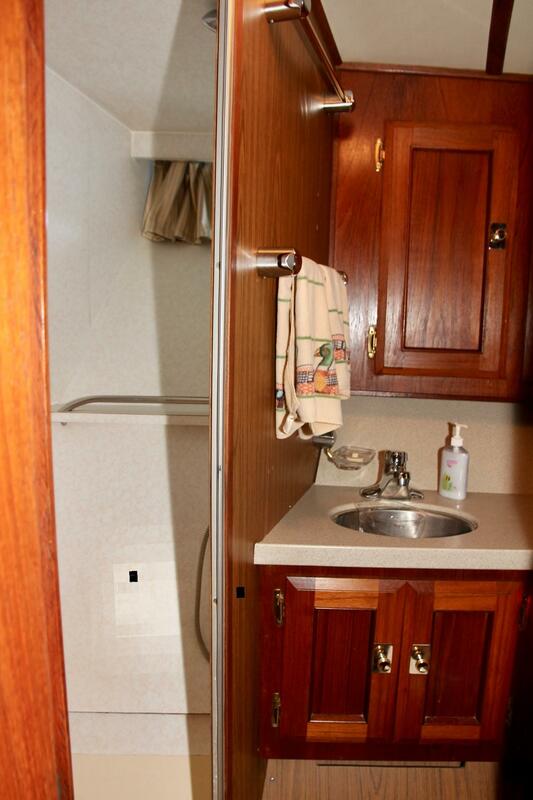 Forward of the galley are two more cabins with another guest head with shower stall. 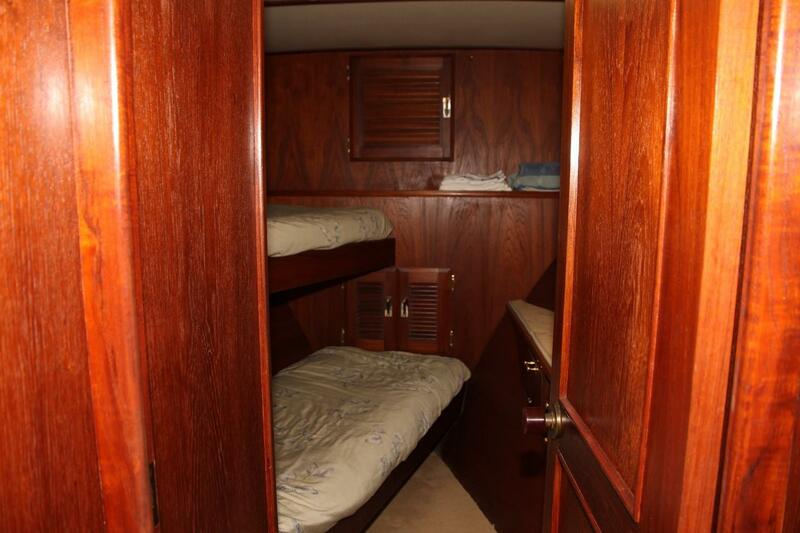 This is a five cabin, three head layout with the master on the main level. 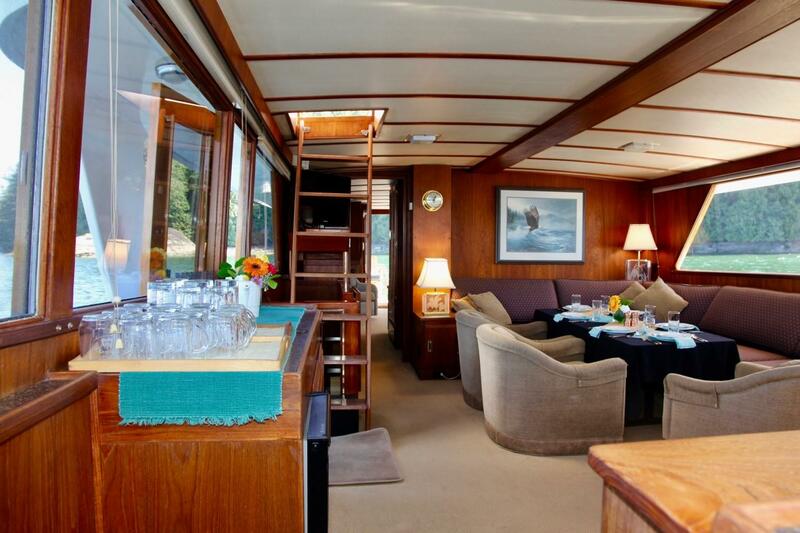 Below and aft, down a staircase from the salon, are two guest staterooms, sharing another private head, and down forward of the galley, are two more private cabins, great for up to four crew, kids, or more guests. 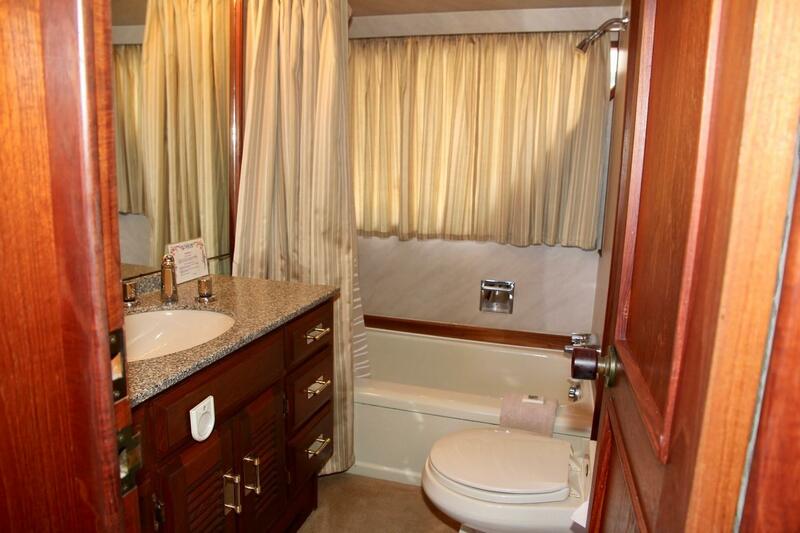 These two cabins also share a private head, each with a private shower stall. This area was created during a vessel renovation in 2010. 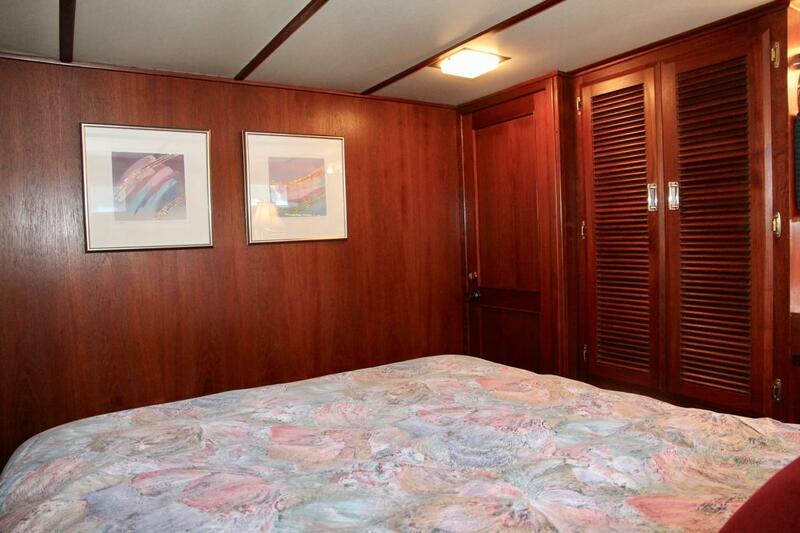 The master stateroom is a suite. There is a private entrance leading aft of the salon, to a wonderful sitting parlour with two occasional chairs, a loveseat, and a teak coffee table. A comfortable space to relax, read, or watch a movie. 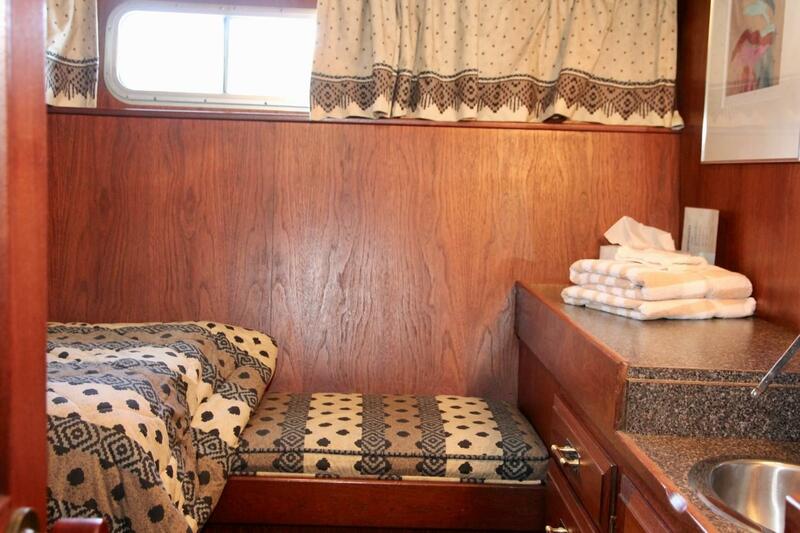 On the forward bulkhead is a completely hidden Murphy bed. 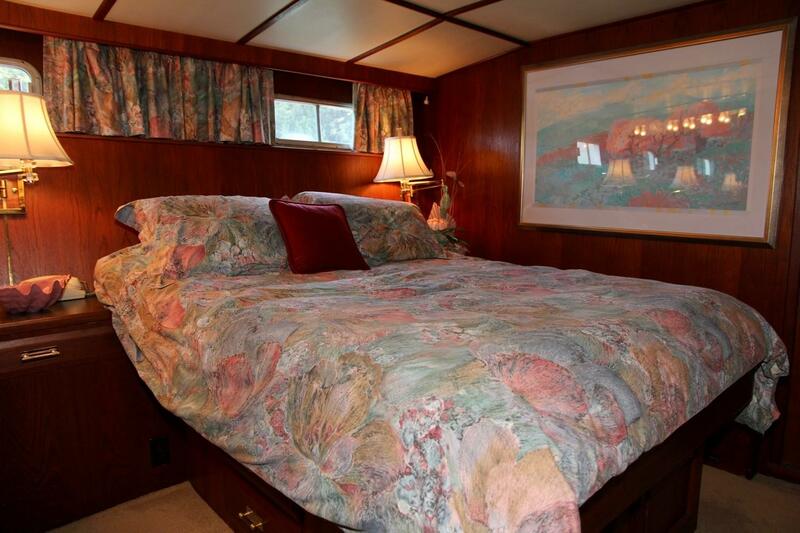 It easily drops to make the master suite into a sleeping cabin. 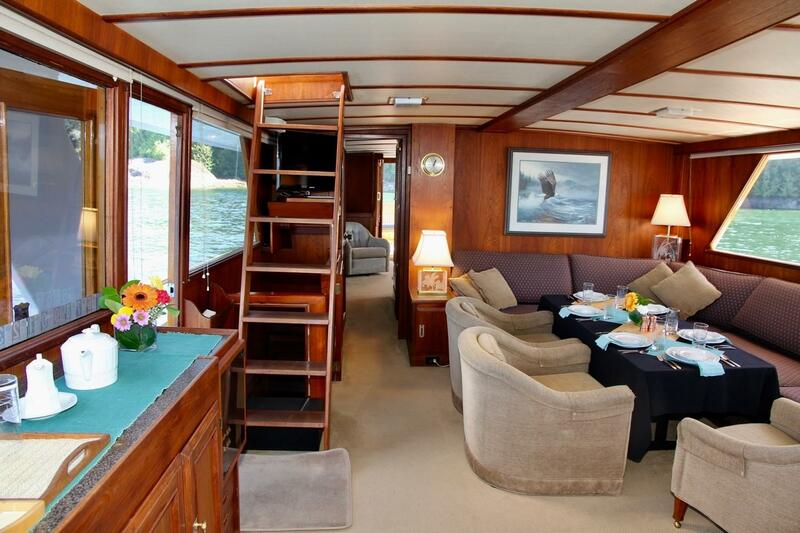 When set up thusly, there are two side tables, reading lights, and another TV on the aft bulkhead. Natural light pours through big windows all around the room including two very large picture windows and a floor-to-ceiling glass door framed in teak. 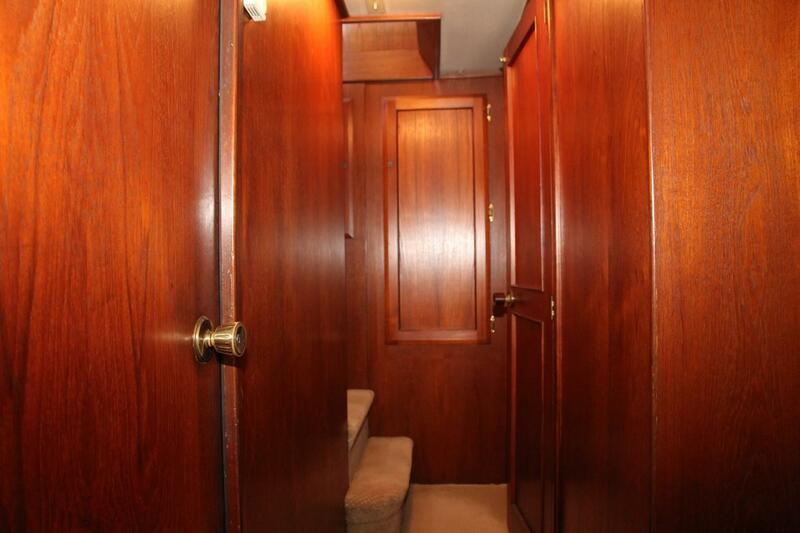 This door leads to the aft deck. 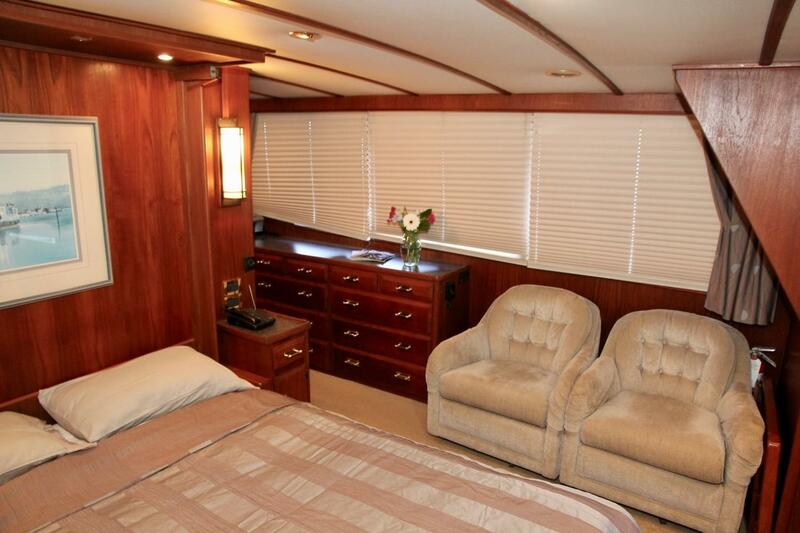 There is a teak valence with window blinds. 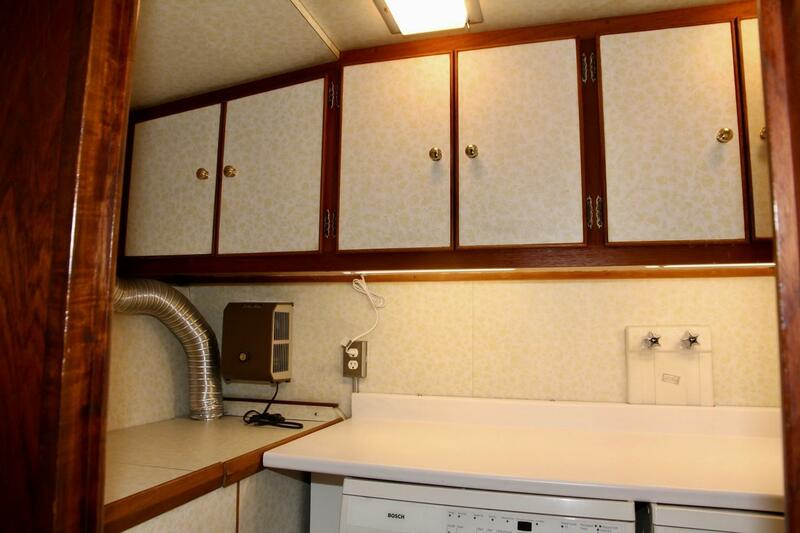 There is bright overhead lighting, dimmable, and two wall sconces. 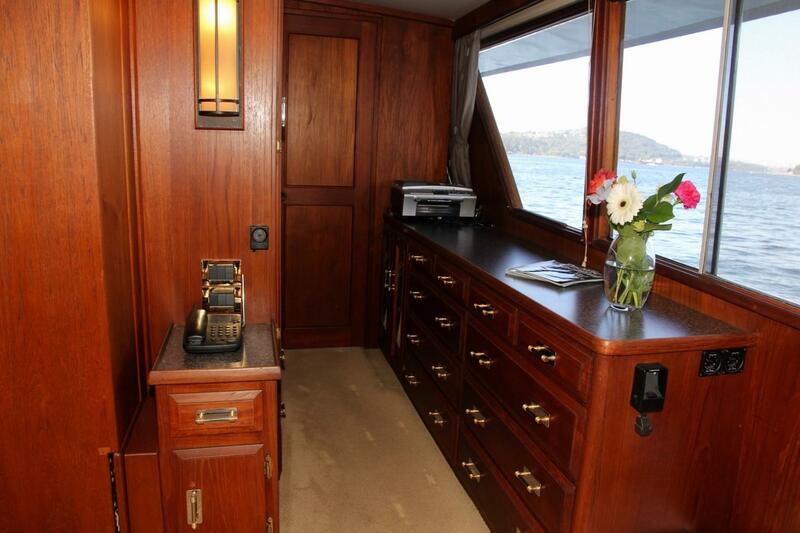 There is plenty of storage for all personal gear in a teak cabinet with a bank of lockers and drawers and a large hanging locker. 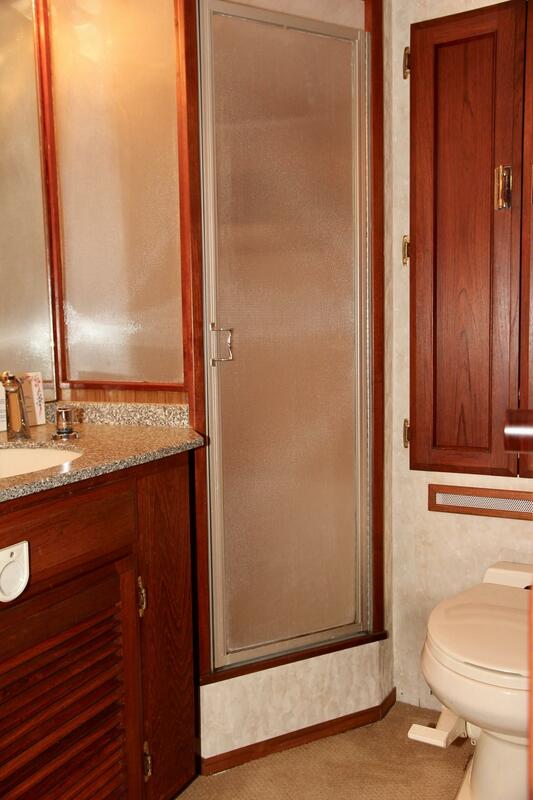 The private ensuite head features a large vanity with more storage, a quiet Vacuflush fresh water toilet, and a tub with a shower. Opening port lights for ventilation. 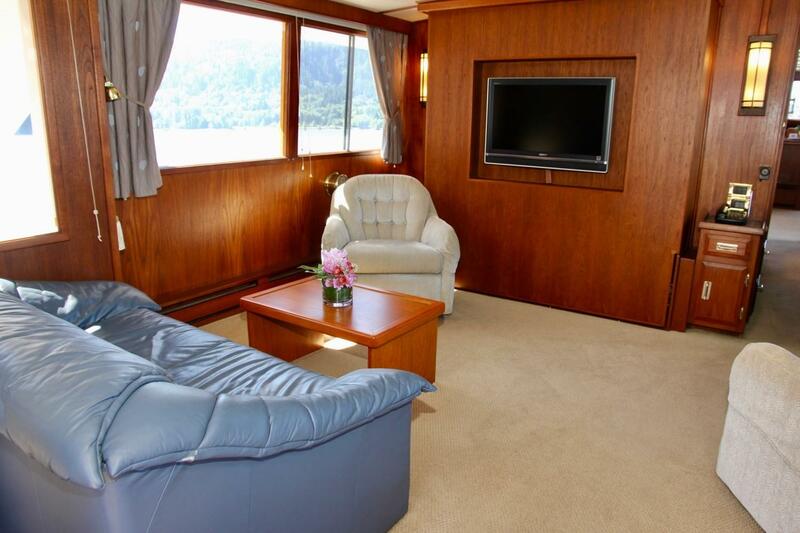 Downstairs from the salon is the guest stateroom area with two staterooms, head, utility room, wine locker, and access to the engine room. 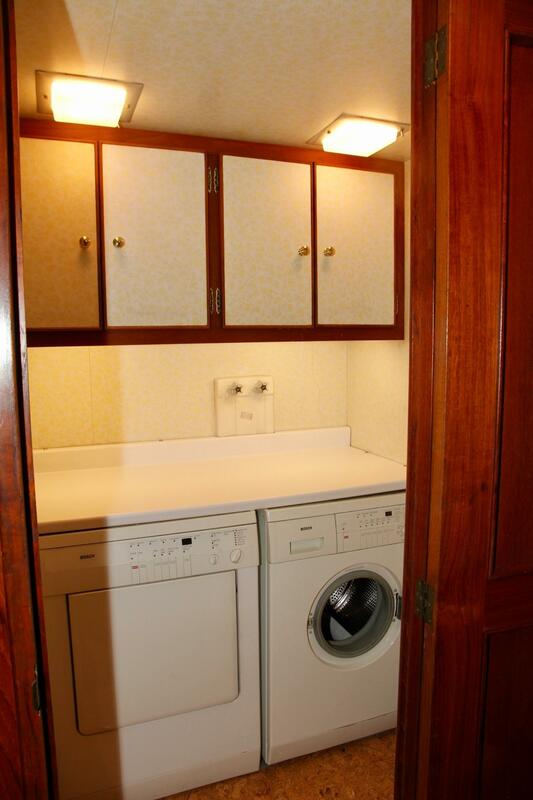 The utility room has separate washer and dryer, storage lockers, working surface, and bright overhead lighting. 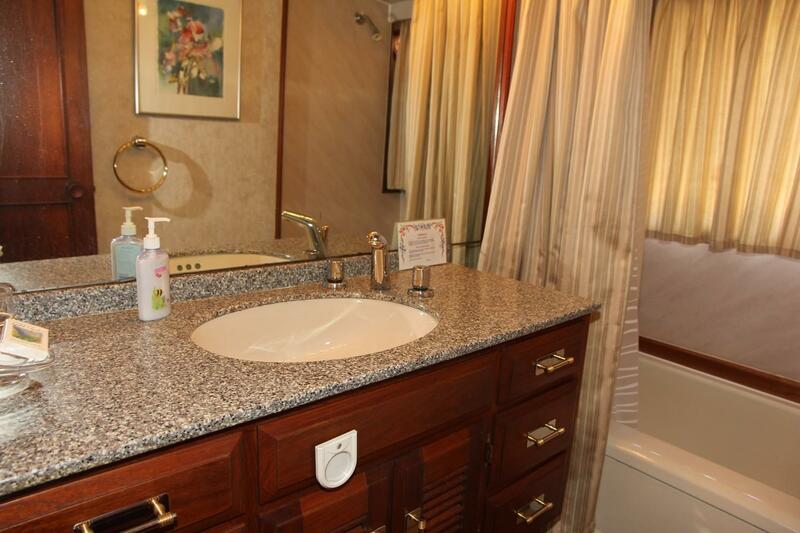 The VIP stateroom has a queen berth, and a vanity cabinet with a hidden sink. 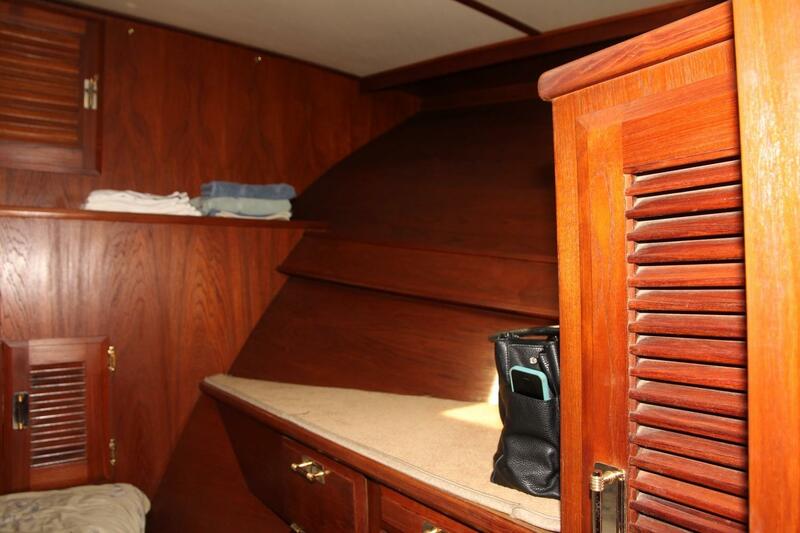 Storage in a large hanging locker and other lockers and drawers. 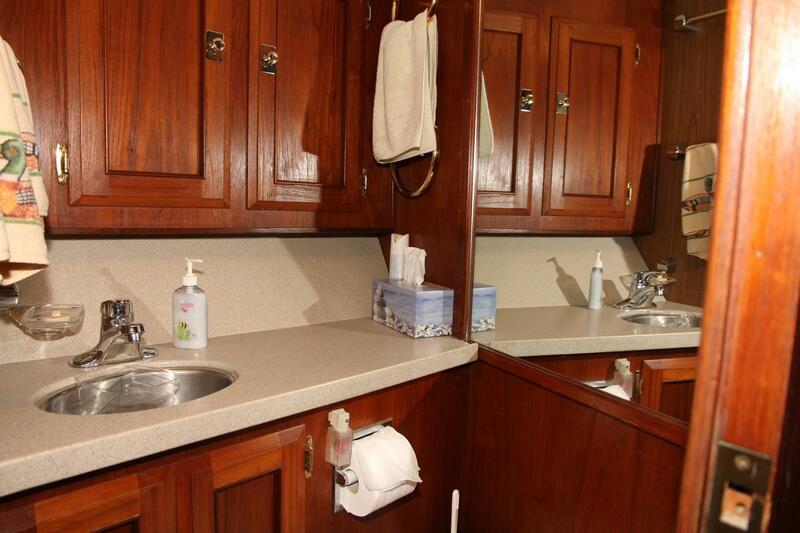 Here are two large twins, storage underneath, hanging locker, vanity cabinet with hidden sink, hanging locker. 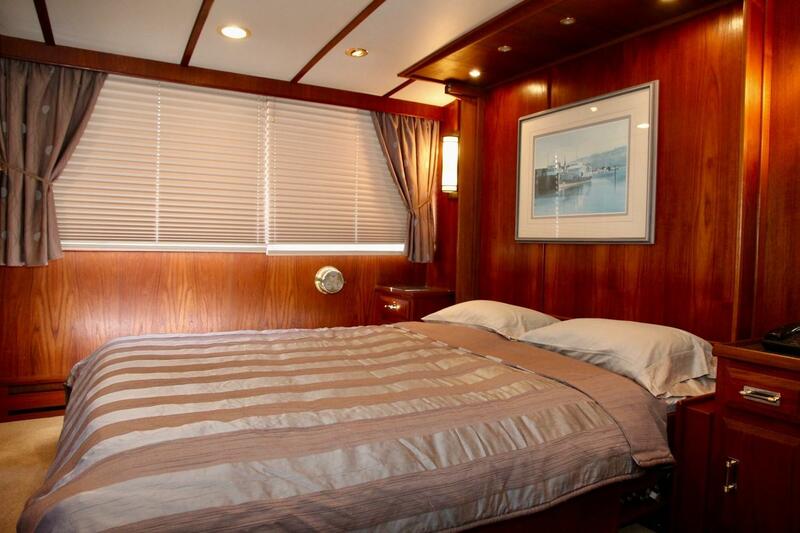 The guest head is shared by the VIP and Guest Staterooms, and is easily accessed from the salon for use as a day head. 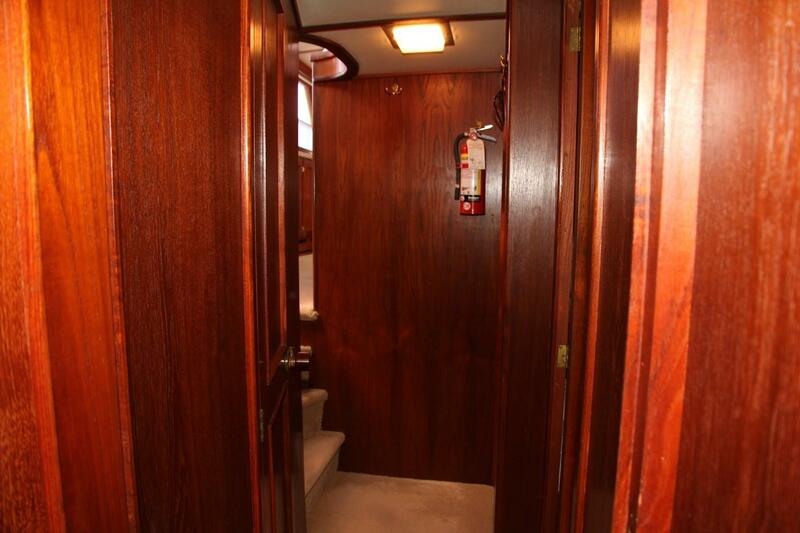 Forward, down a few steps from the galley, are the crew quarters in two cabins. 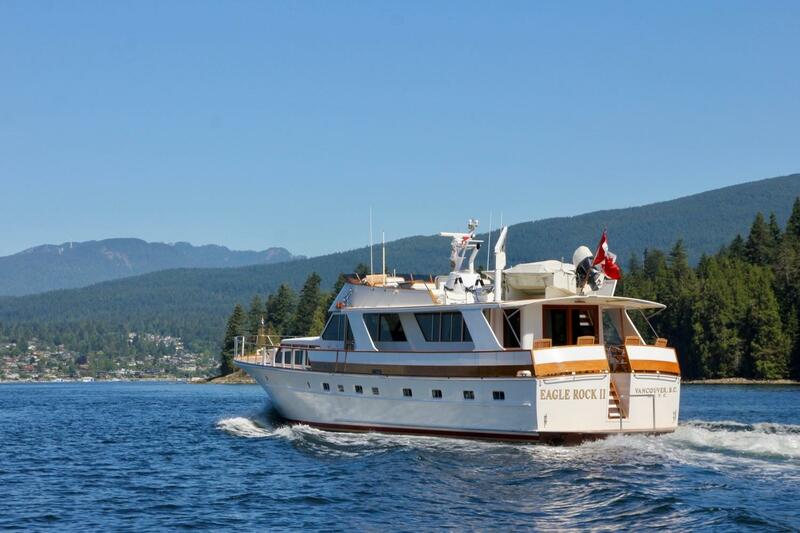 Eagle Rock II is a family boat, and can certainly be owner-operated. 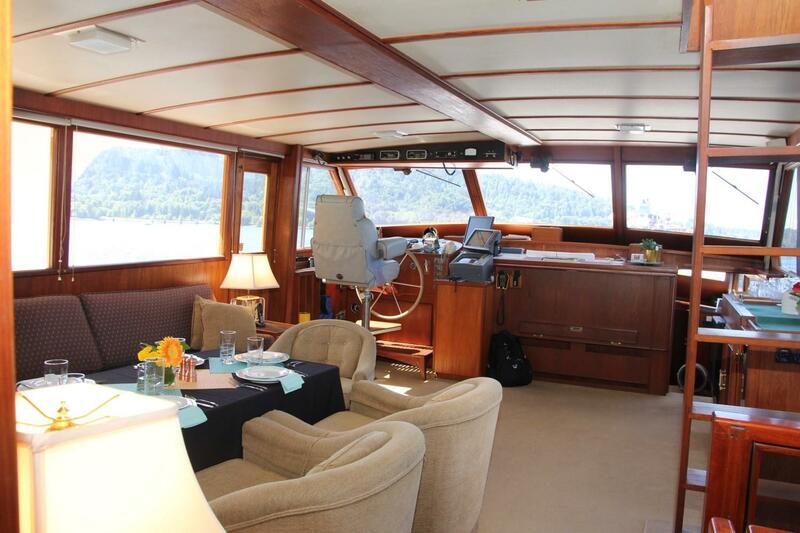 These owners employ a full-time captain and a part-time deck / stew. 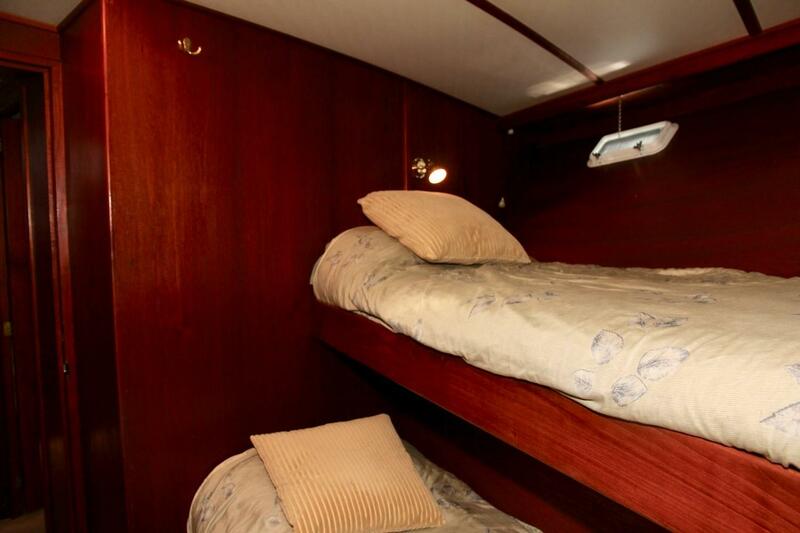 All the way forward is a cabin with two bunks to the port side, a desk to starboard, and storage in drawers, lockers and a hanging locker. 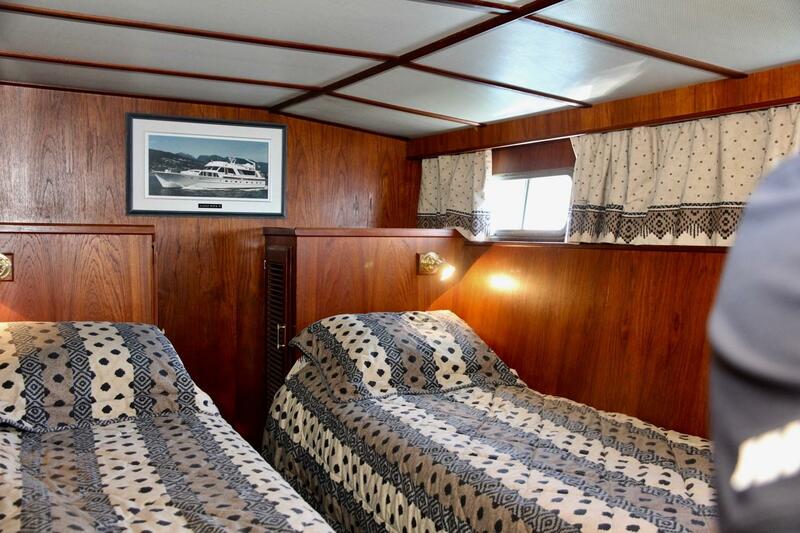 The captain's cabin is next, just aft, and also on port, with two bunks running perpendicular to each other. There is a flatscreen TV on the forward bulkhead. Storage in drawers and a hanging locker. 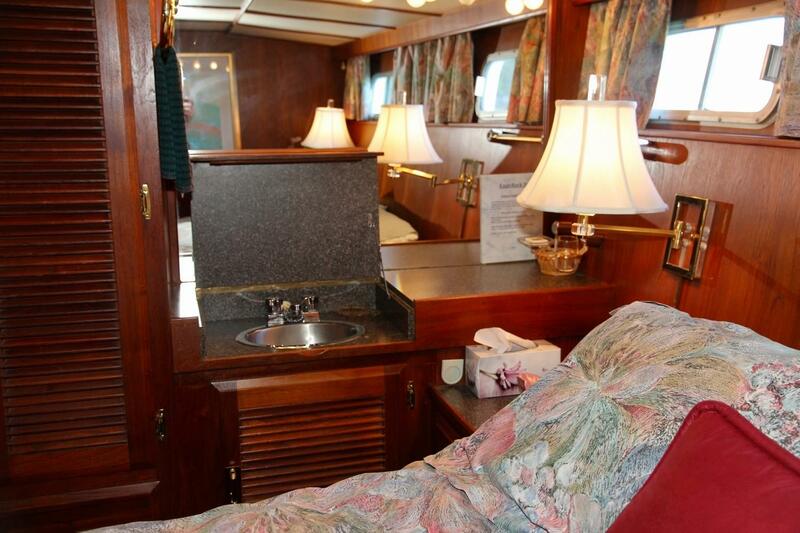 Both cabins have good lighting and opening port lights. And both share a private head with fresh water Vacuflush toilet, and storage lockers and there is a separate shower stall. 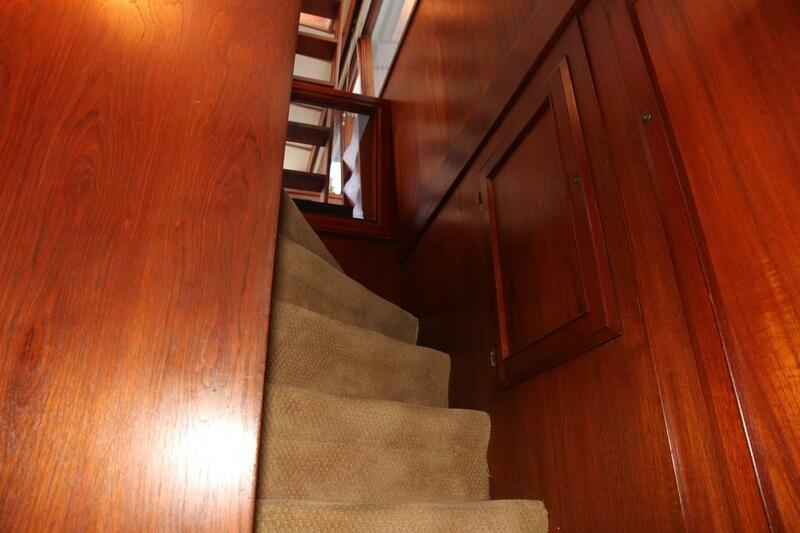 The interior of the boat is accessed through doors from the port or starboard side decks. Finished throughout in teak, with a light headliner trimmed in teak. Large windows running the length of the salon flood the area with natural light, and there are window coverings hanging behind a teak valence. 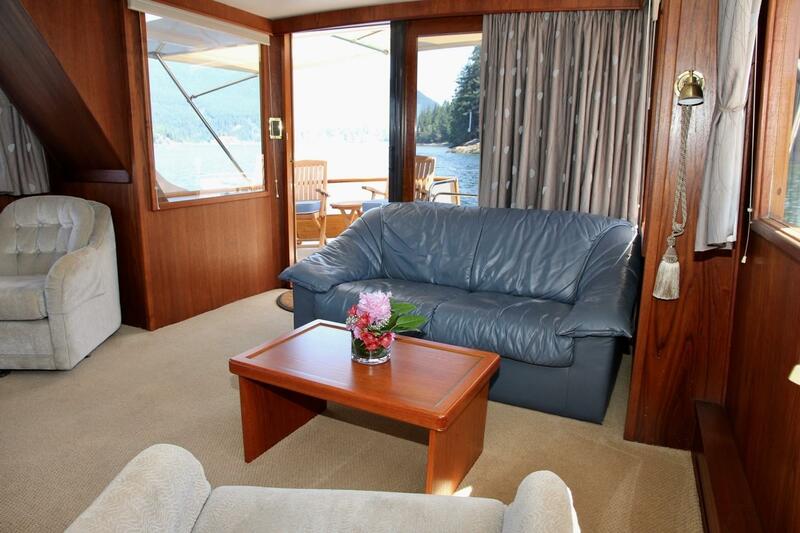 There is a broad L-shaped settee and occasional chairs with enough seating for a group of twelve or more. For dining, the table amongst these seats will comfortably accommodate six. 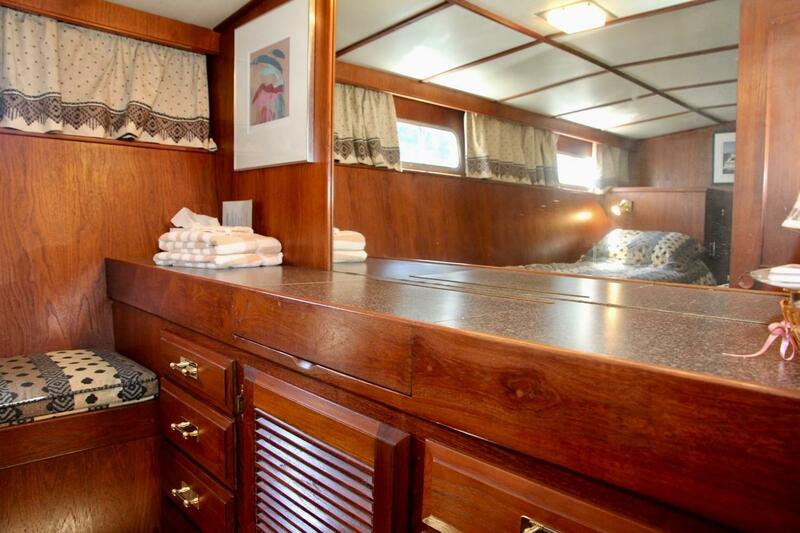 On the starboard side of the salon is a large wet bar with copious storage for all glassware and bottles on slide out shelves custom made to minimize the risk of any glassware breaking. And a counter for setting it all up for a party. 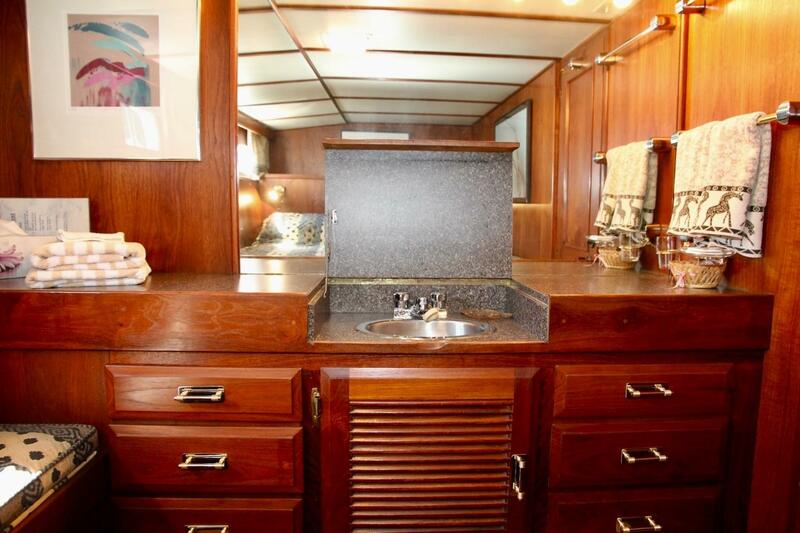 The renovated galley is down four steps from the salon / lower helm. 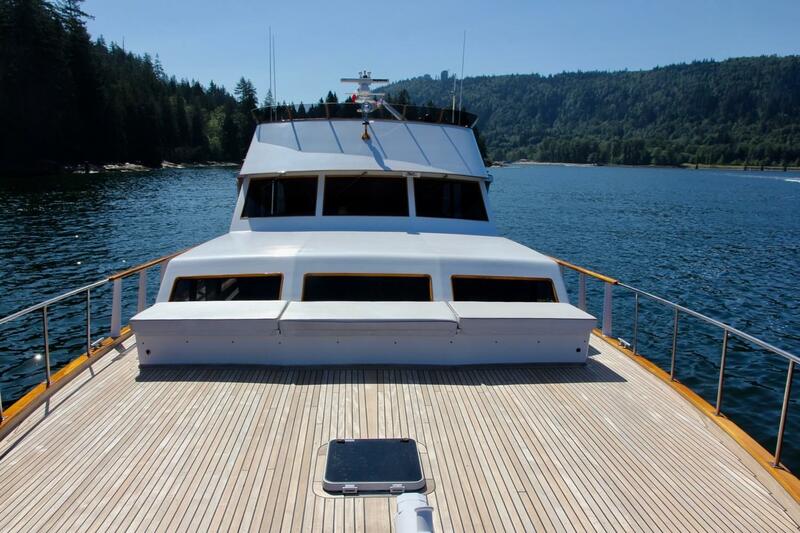 Like many flush deck designs, this is an expansive space, using the full beam of the vessel. 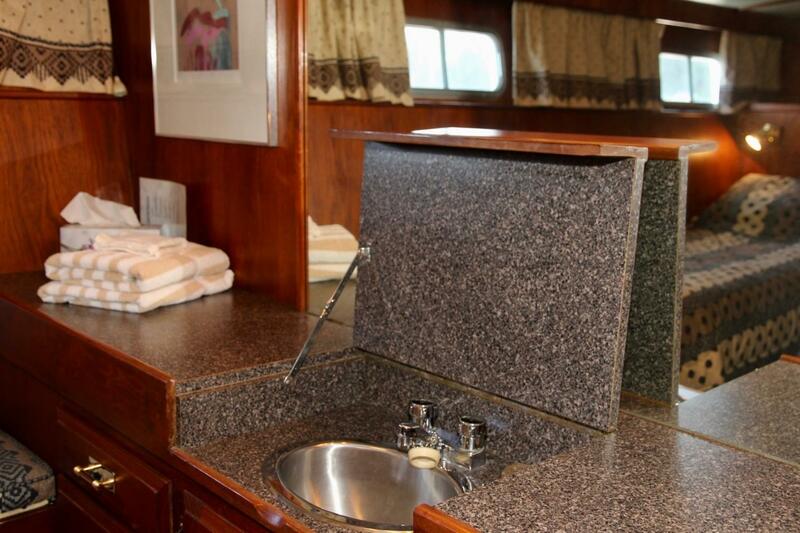 Unlike many flush decks of this size, Eagle Rock II's galley is set up with a warm, comfortable sitting area instead of a dinette (since all dining is usually done on the flybridge, aft deck, or salon). 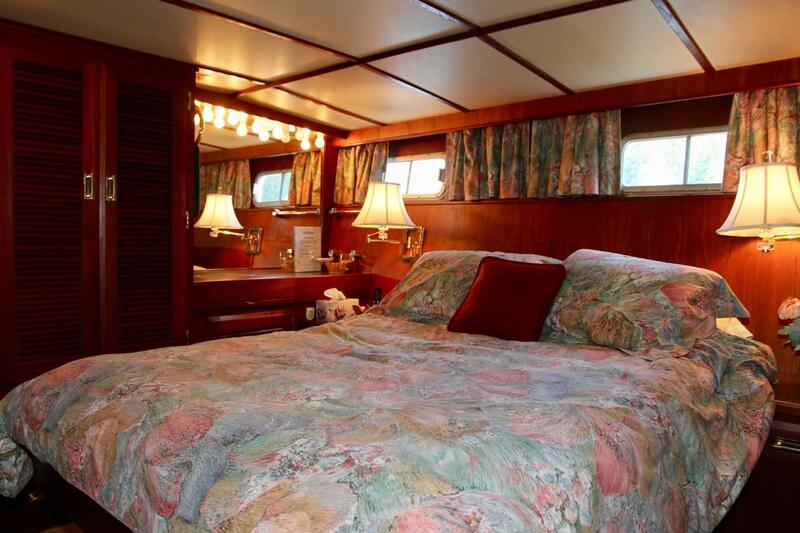 There is bright overhead lighting, and plenty of natural light from big windows on port and starboard, the full length the galley, as well as three forward facing windows to the foredeck. 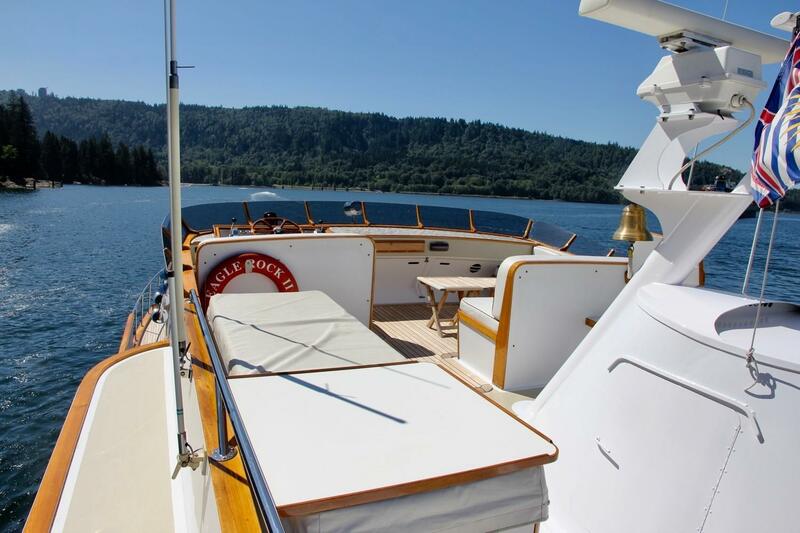 Eagle Rock II, being a flush deck motor yacht, has the lower helm located forward and to port of the salon, on the same level. 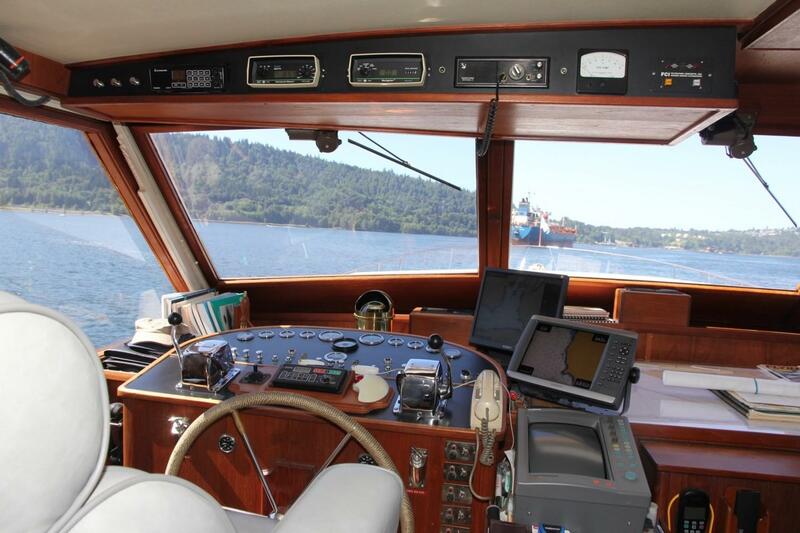 The helm area is distinctly located just forward of midships giving the vessel operator superior visibility and a stronger feeling of control than other such designs where we see the helm further forward. 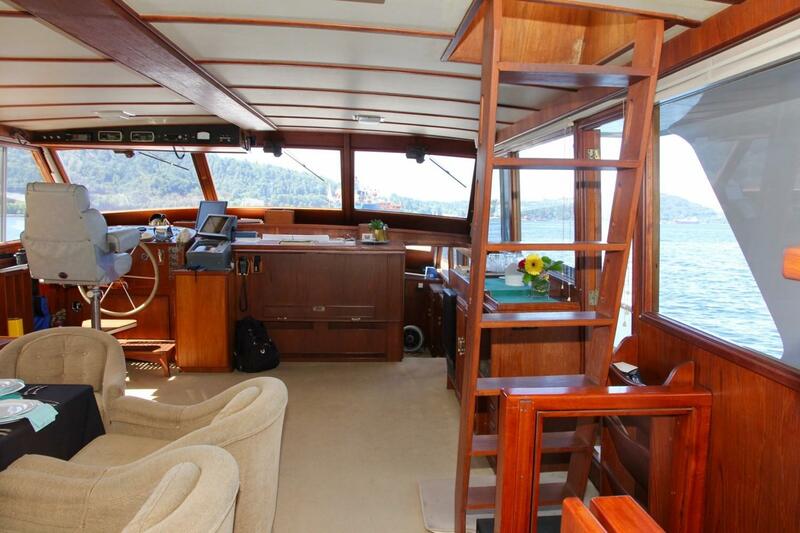 The area is also finished in solid teak with all communication and navigation equipment close at hand, and with an expansive chart table and storage locker just to the right. 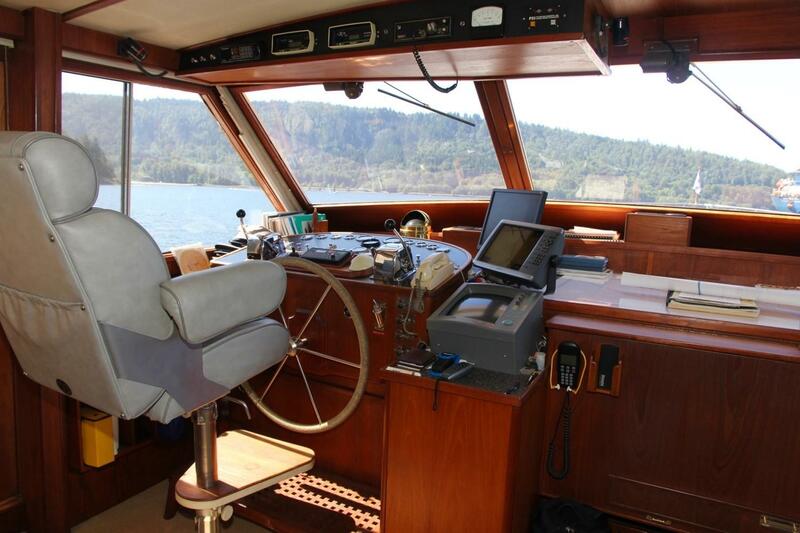 There is a large elevated upholstered helm seat with foot rest, positioned for great visibility and within easy each of all controls and all navigation and communication equipment. The flybridge and boat deck are accessed on the exterior via a staircase from the aft deck, or inside by another staircase from the salon. 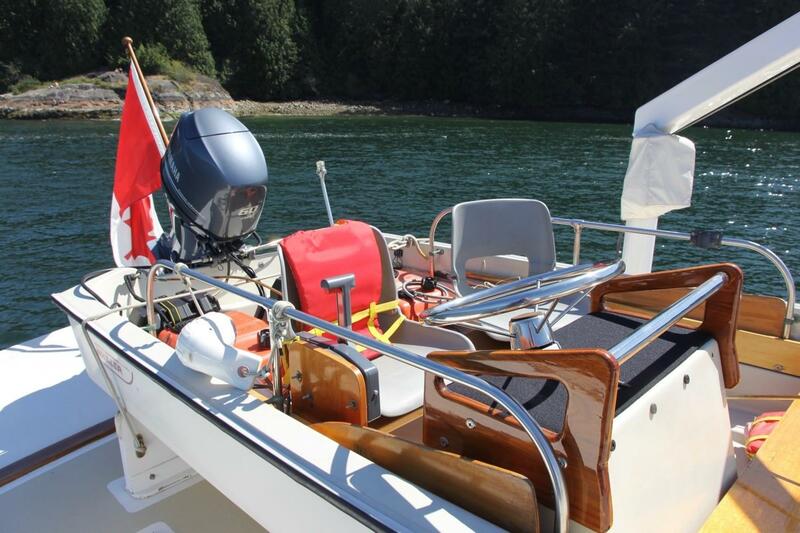 The upper helm is to port, with a bench seat. 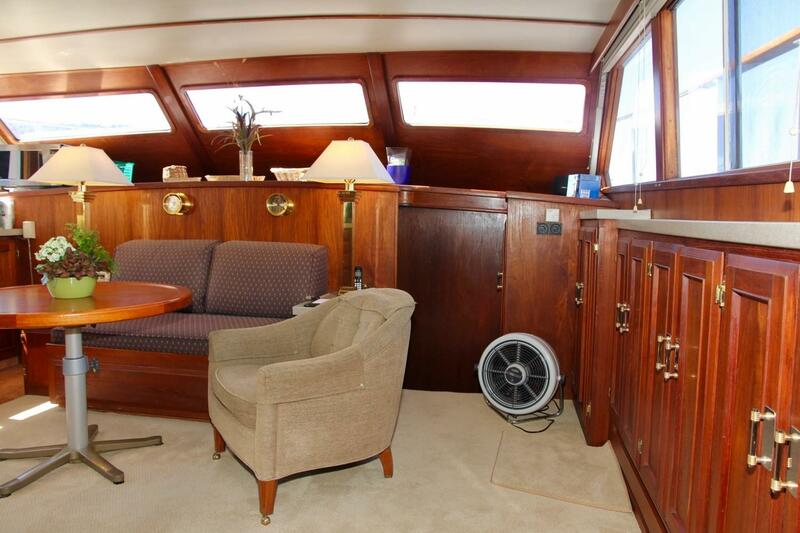 There is an L-shaped settee to starboard, with a Venturi screen all around this forward seating area. 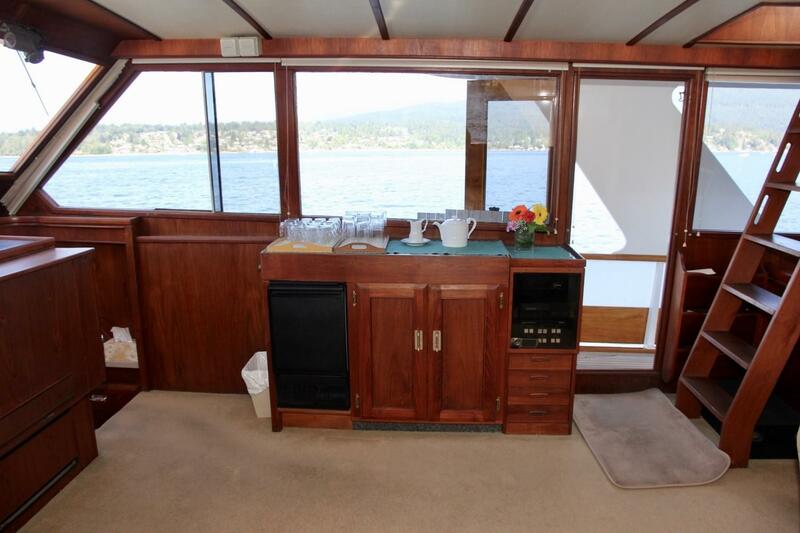 The area is painted white with bright teak trim, and a custom dash with storage underneath. 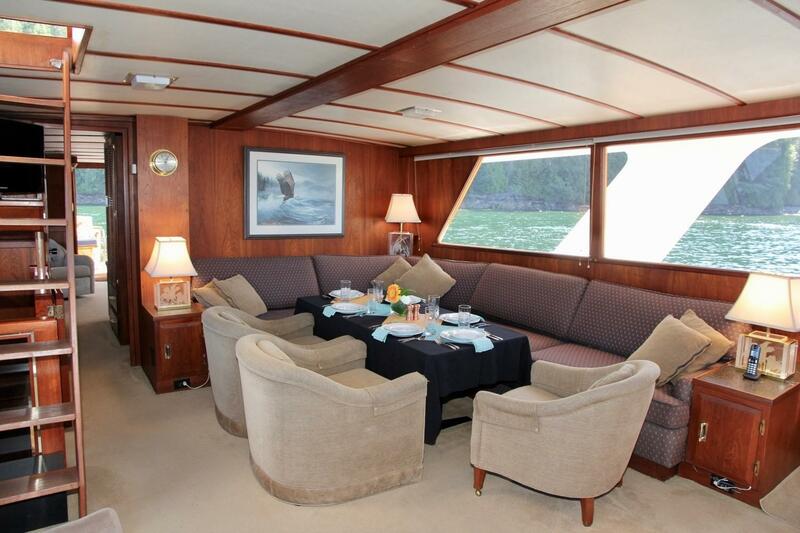 The seating area can accommodate a dozen or so guests on the fixed settees as well as on folding teak furniture. Bulwarks are safely high, and are topped with varnished teak caprail and a stainless railing that extends aft from the Venturi. 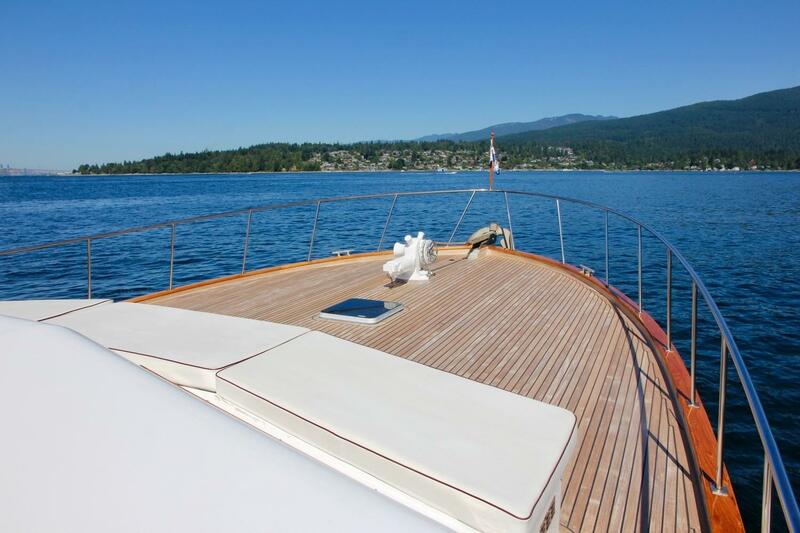 The boat deck, aft of the flybridge can easily carry the tender, the jetski, and all manner of cruising toys should you care to add kayaks or other gear. 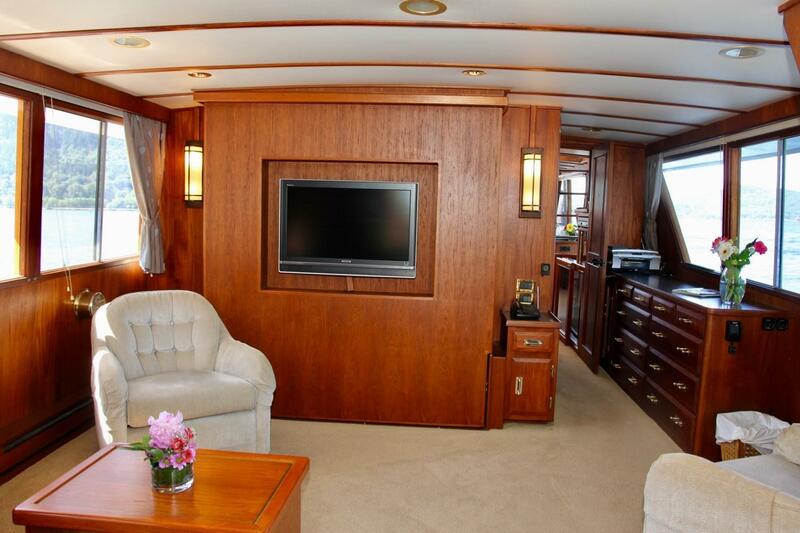 The bulwark extends aft just past the settee area, and a stainless safety railing continues aft. 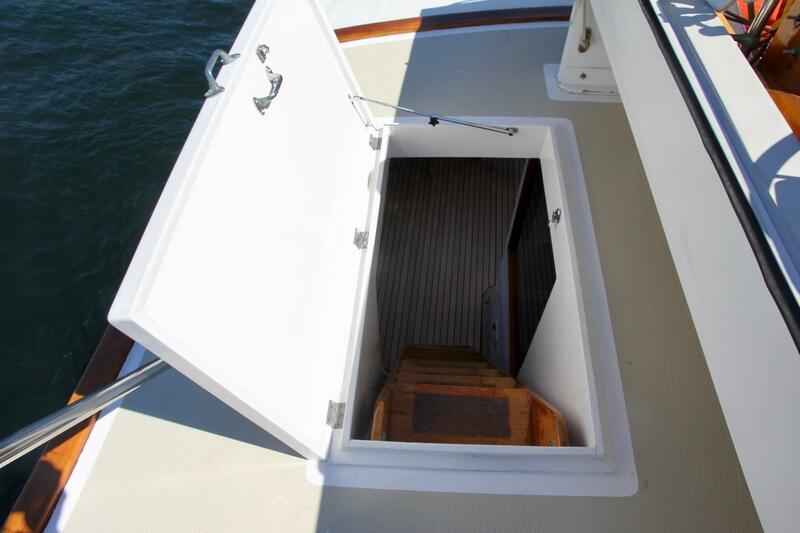 Aft and to starboard, there is a ladder to the aft deck, with a hatch. 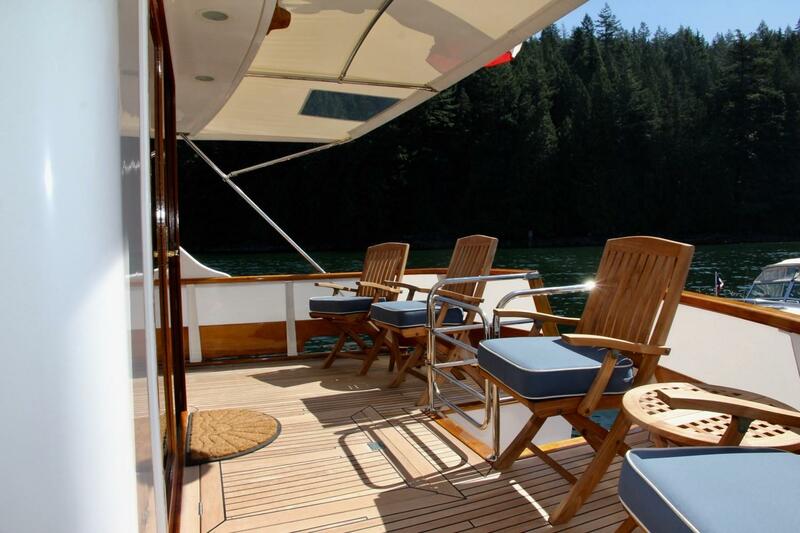 Varnished teak caprails surround the decks, with varnished teak railings on the side decks, transitioning to stainless railings forward. 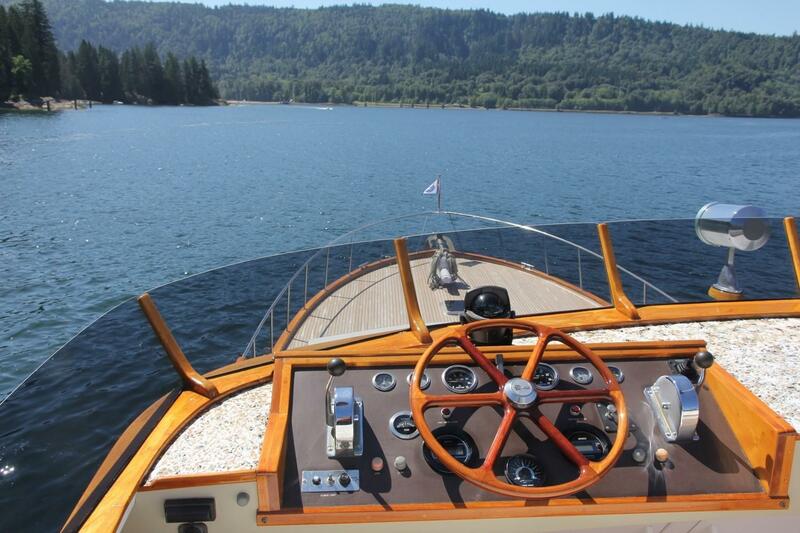 The decks are all teak clad and are in near-perfect condition. Beefy mooring cleats fore, aft and midships. 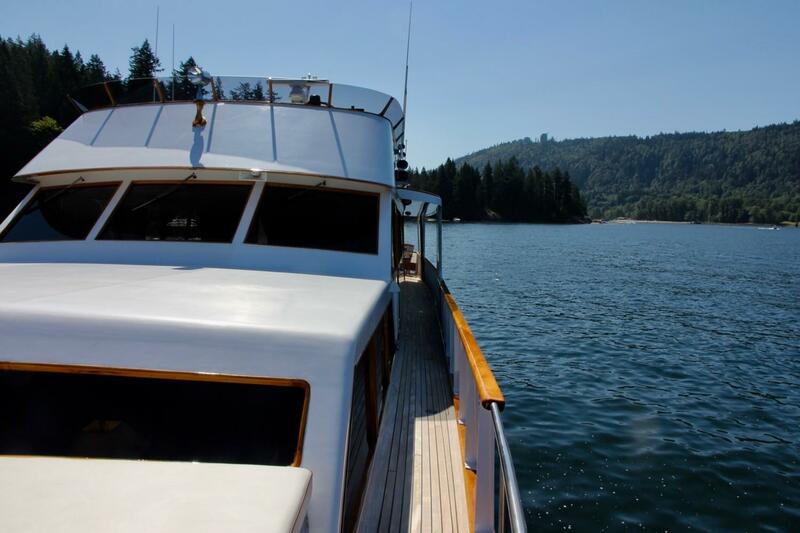 Starting aft, the original swim grid was deemed far too narrow, especially for boarding astern, so it was completely rebuilt. 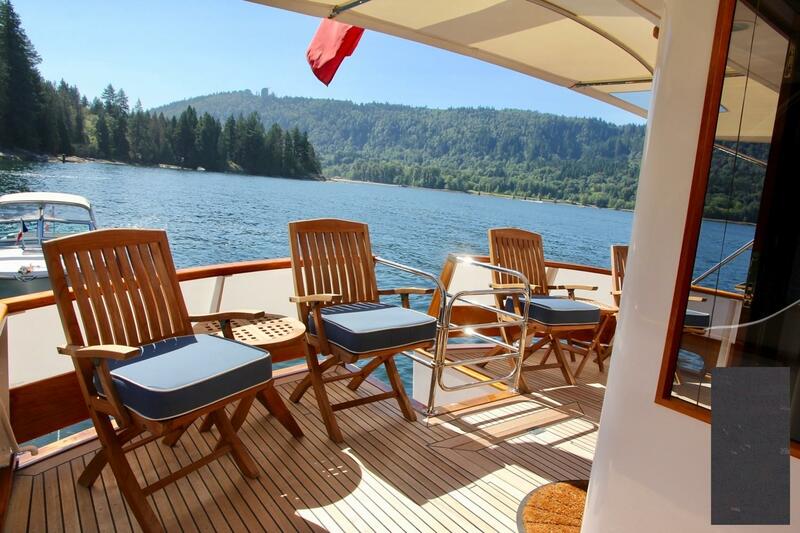 This new swim grid is of solid teak, and is now much safer, being broader, and includes stainless steel staple railings, and retractable tender cleats. 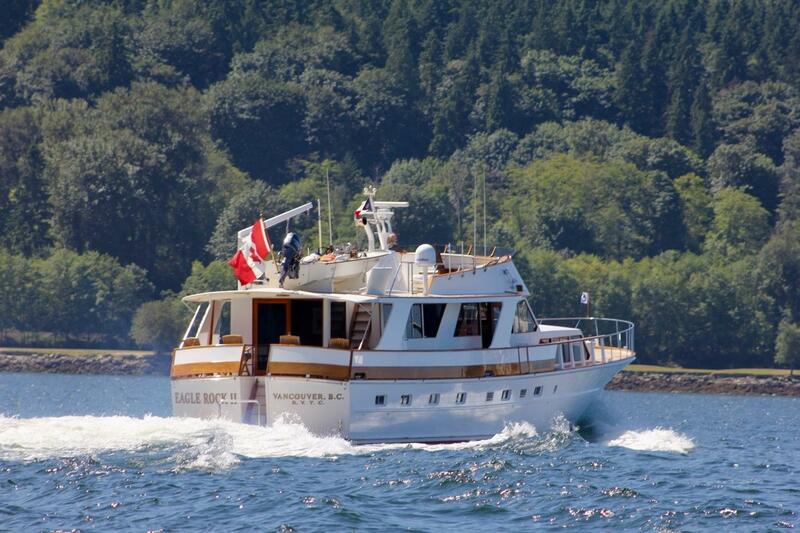 And the extra length smartly compliments the overall lines of the vessel. 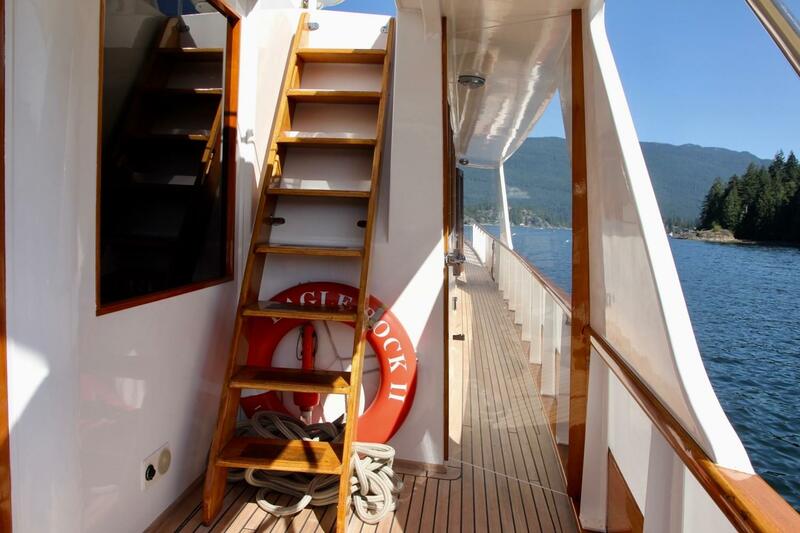 From the swim platform, gently sloped stairs go up to the aft deck, beautifully clad in teak, and protected with a stainless railing and gate to the swim platform stairs, high painted bulwarks with a varhisned teak caprail. There are four teak occasional chairs with two cocktail tables. So perfect for a morning coffee or an evening sundowner! There is also a private entrance here to the owners suite. 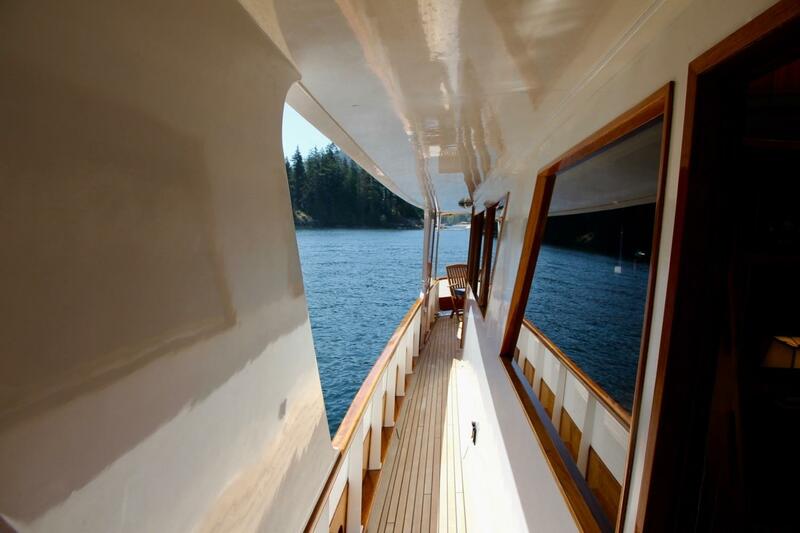 The aft deck is protected by the overhanging boat deck above, which covers most of the aft deck. 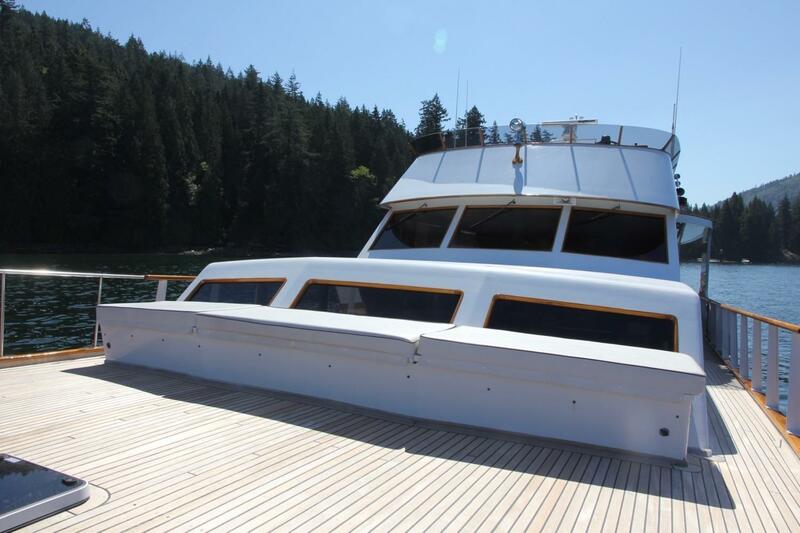 Then there is an integrated stainless steel framed eyebrow cover that extends further for full protection of the aft deck. 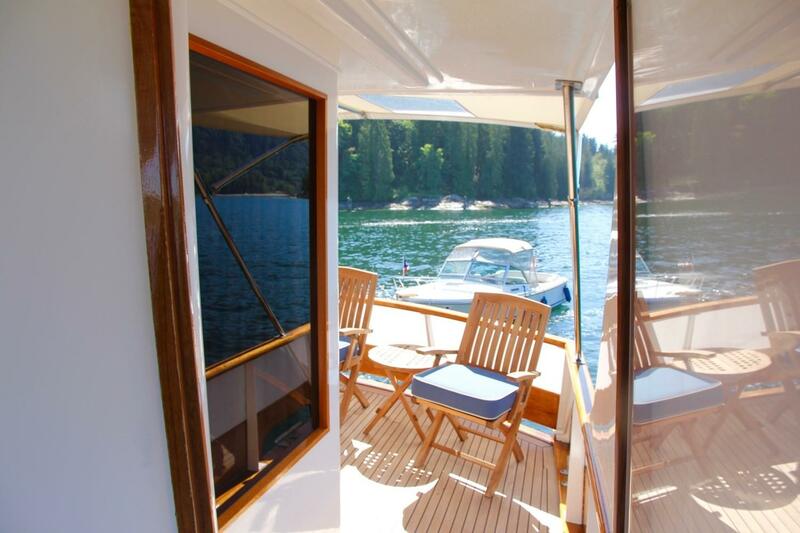 Port and starboard, teak-framed wing doors to the side decks protect the aft deck from wind. 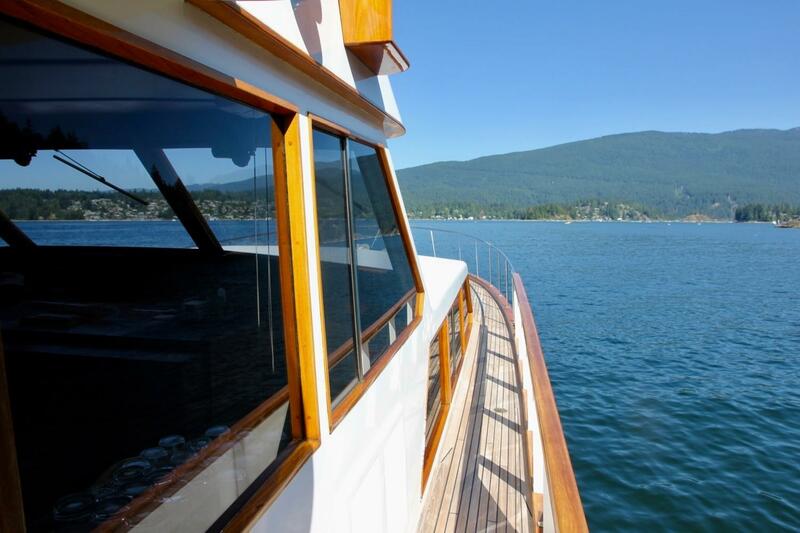 Walk forward from the aft deck to the foredeck on wide safe side decks, also covered for protection. 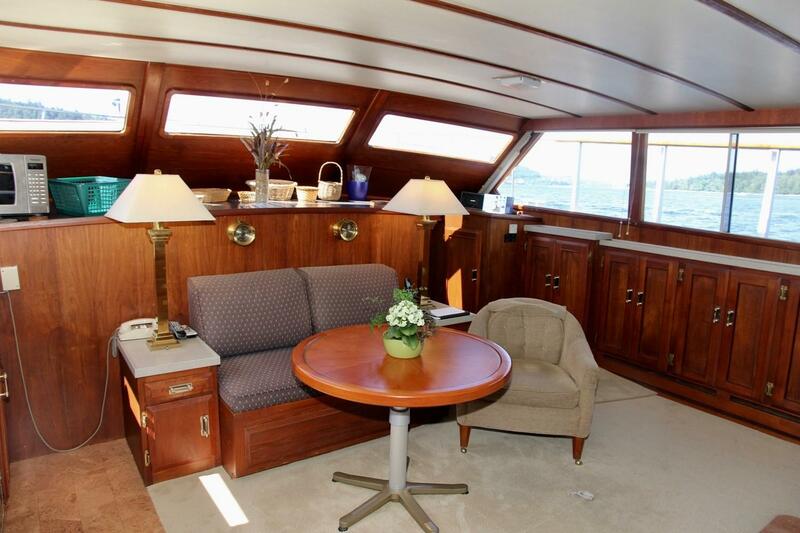 The sweeping foredeck is a field of teak, a superb space for lounging. 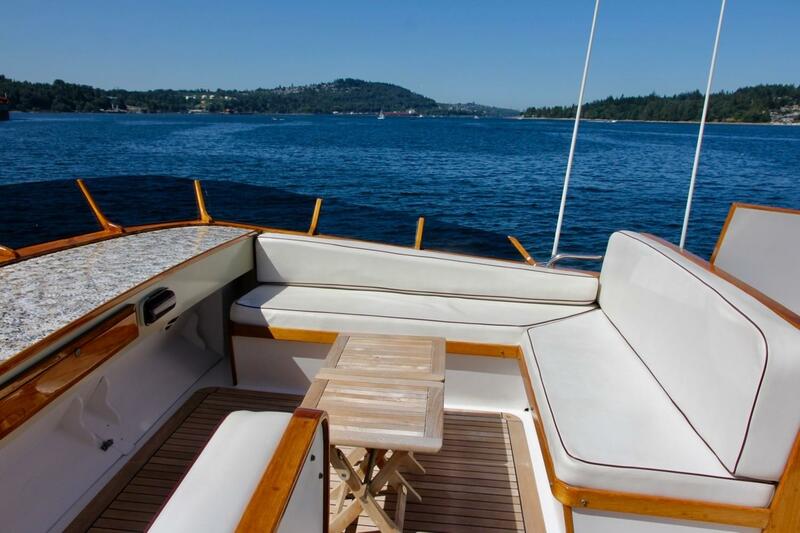 There is a large upholstered bench, facing forward, with plenty of storage below for shorepower cords, adapters, extra safety gear, and there are two Bose speakers stowed there, ready to be plugged into the provided fittings when a little music is desired. Saura magnetic compass with brass binnacle cover. Founded in Japan in 1915, Saura compasses are known for high precision engineering, including a patented air bubble collection chamber. 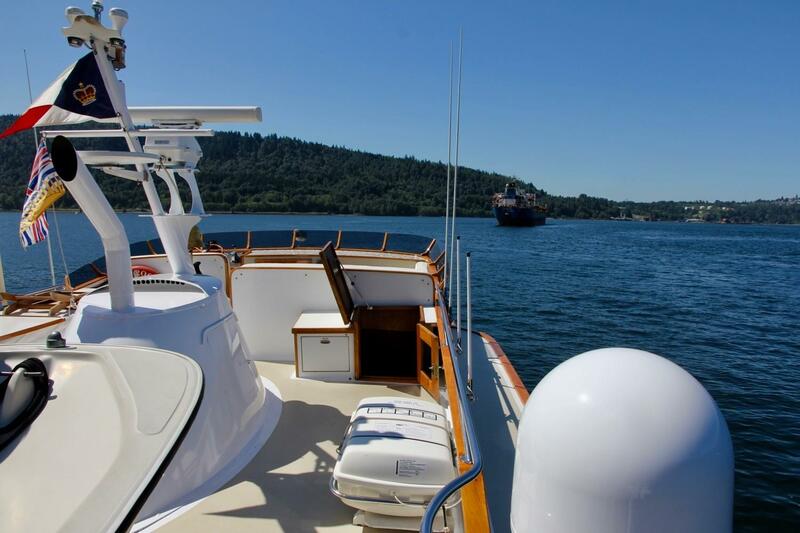 Owners and guests can rely on the rugged AC and DC power systems, servicing the vessel through circuit breaker panels with appropriate voltage and ampere gauges. 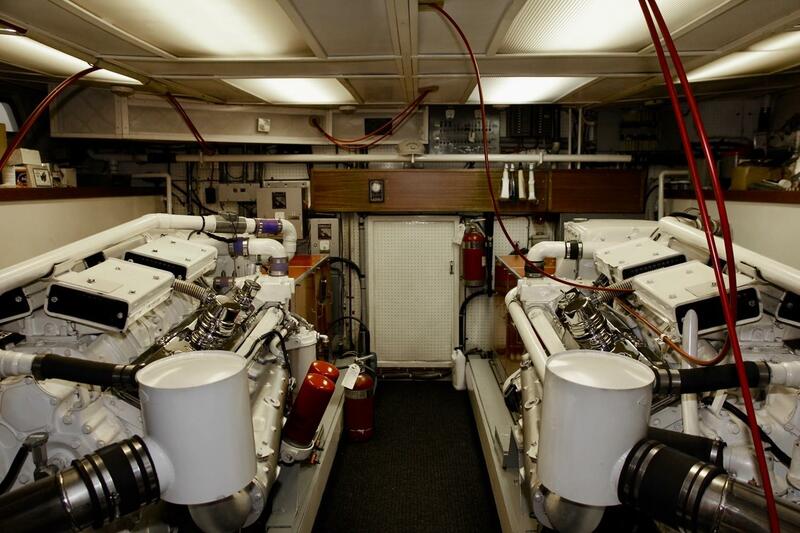 110VAC is provided by 50 Amp shore connection (bow or stern), by the two 20 kW Westerbeke generators, and, based on available house bank battery power, through the inverter. 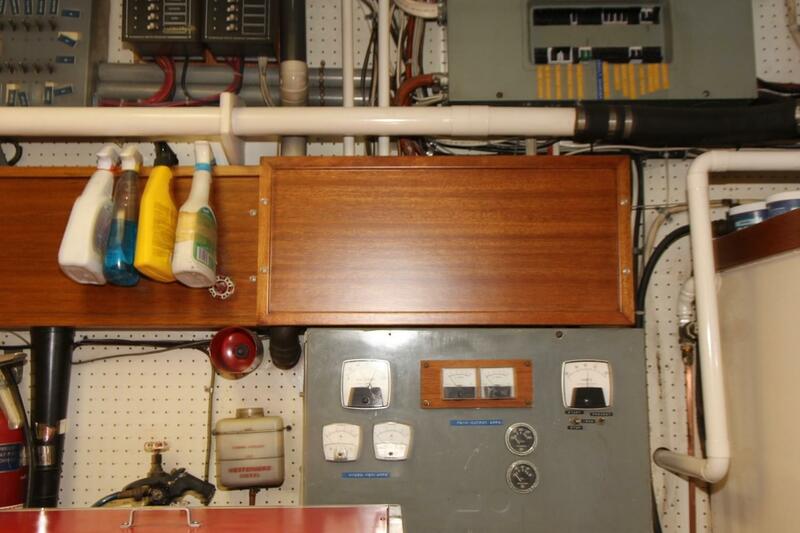 Electro Guard cathodic protection system: This is a controlled sacrificial anode system providing complete protection against galvanic corrosion. 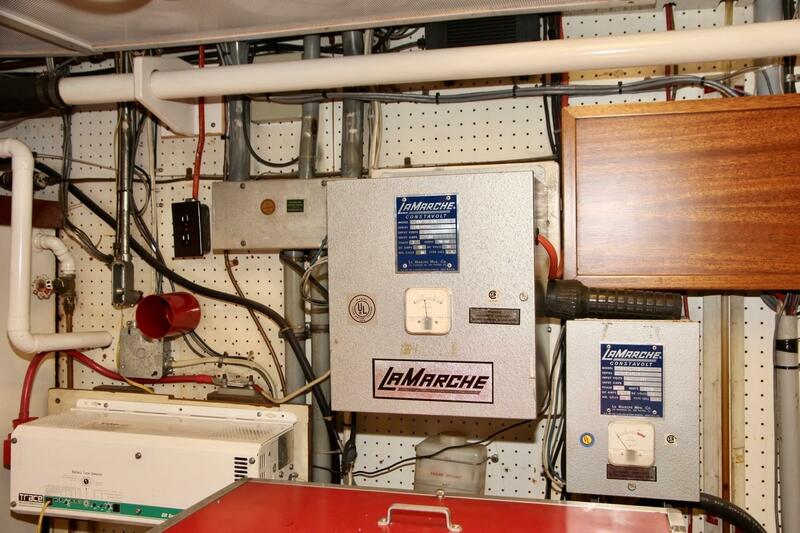 A monitor allows a visual indication of system performance and early warning of stray corrosion currents from electrical faults. Caustic attack to wood at protected fittings is prevented. 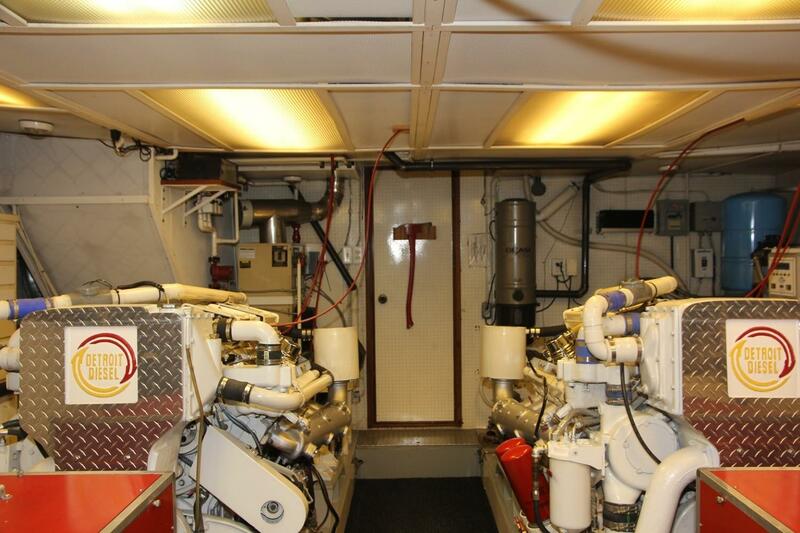 Ship's batteries: Separate banks of batteries for the house, the inverter, genset start, main engine start, and thruster. Each bank has a dedicated charger. 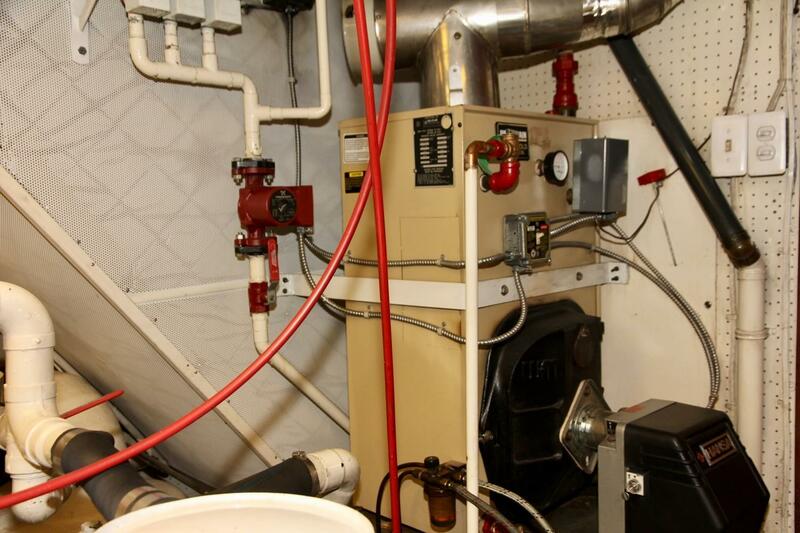 House and engine batteries are wet cell, and all are contained in approved non conductive boxes, and all are easy to access for monitoring and service. The thruster batteries are new, and are 24V AGM. 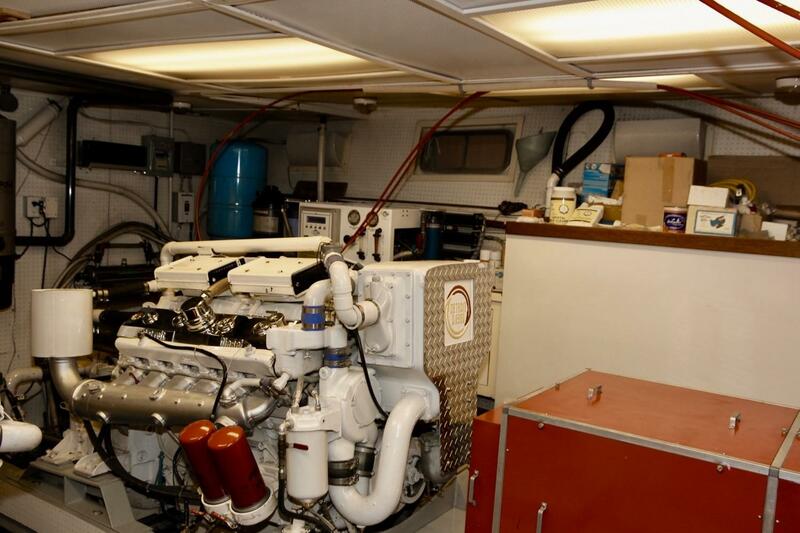 At sea, the batteries are charged by engine or generator driven alternators and while at a dock, by the inverter and chargers via shorepower. The machinery space is bright, extremely well organized, and clean. 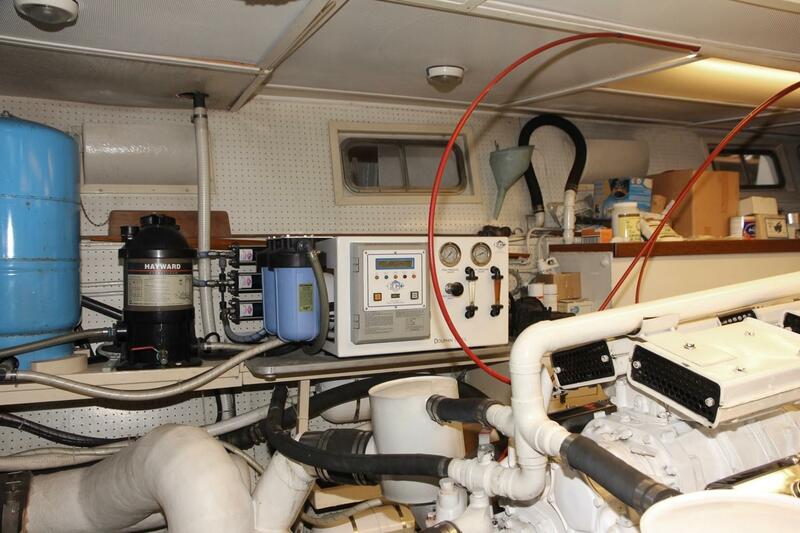 Pristine even, with dry, painted bilges. 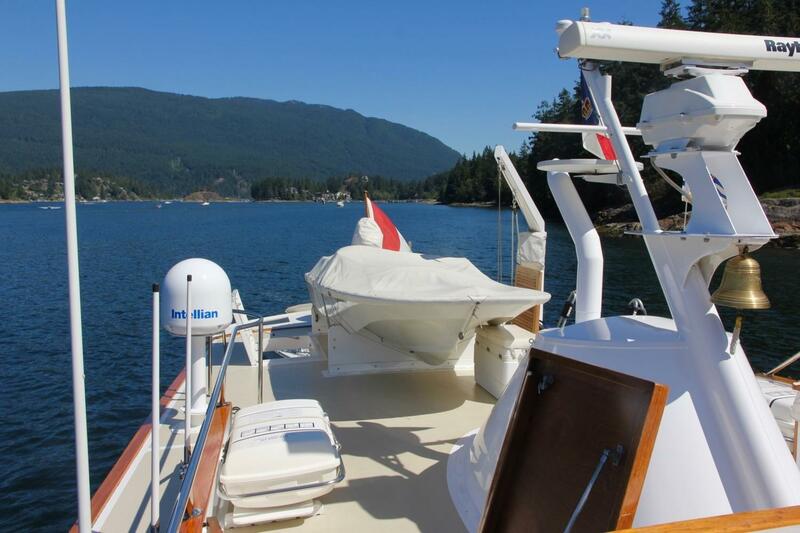 The machinery is meticulously serviced and with a strict regimen of preventative care ensuring worry-free cruising every season. 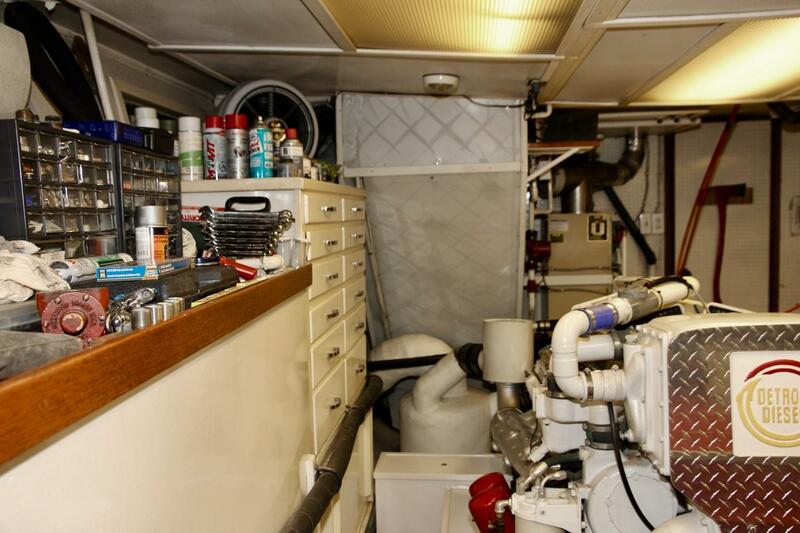 The engine room is lined with numerous storage shelves, drawers, and lockers for tools, spares and other equipment. 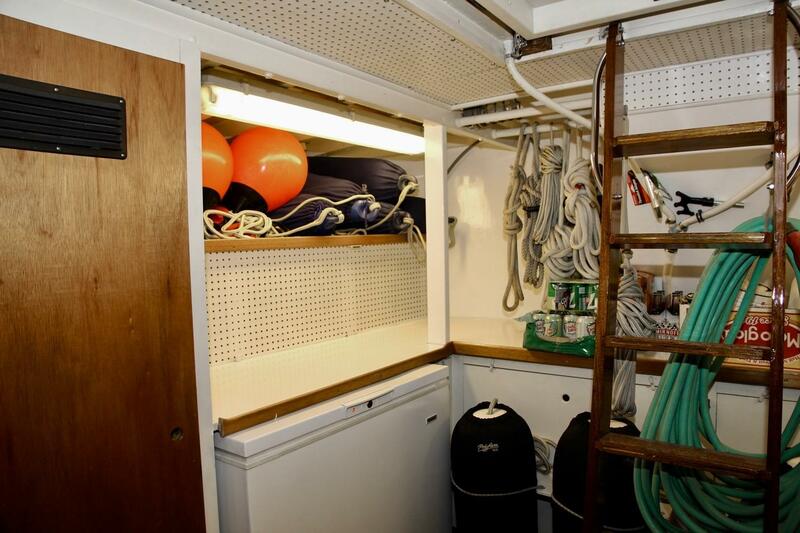 Forward of the engine room, through another bulkhead, (now beneath the galley) is a storage and utility room. 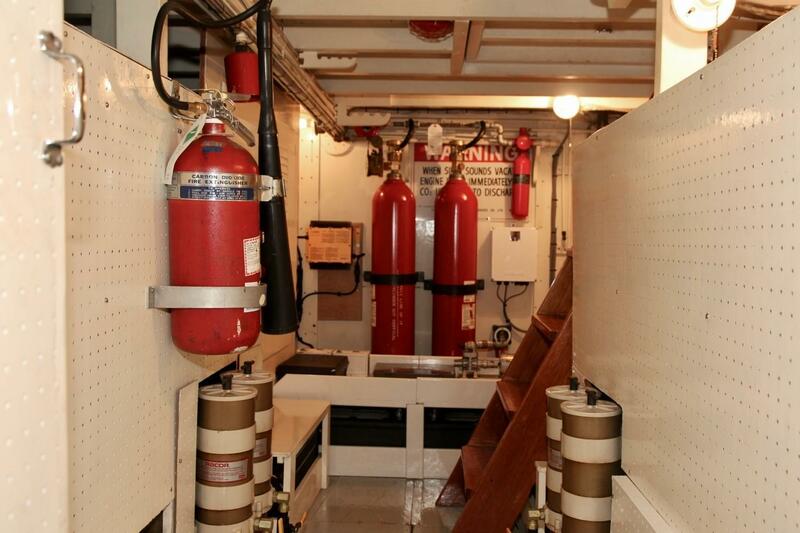 Here are fuel tanks, batteries, Racors, fire suppression, and storage lockers. 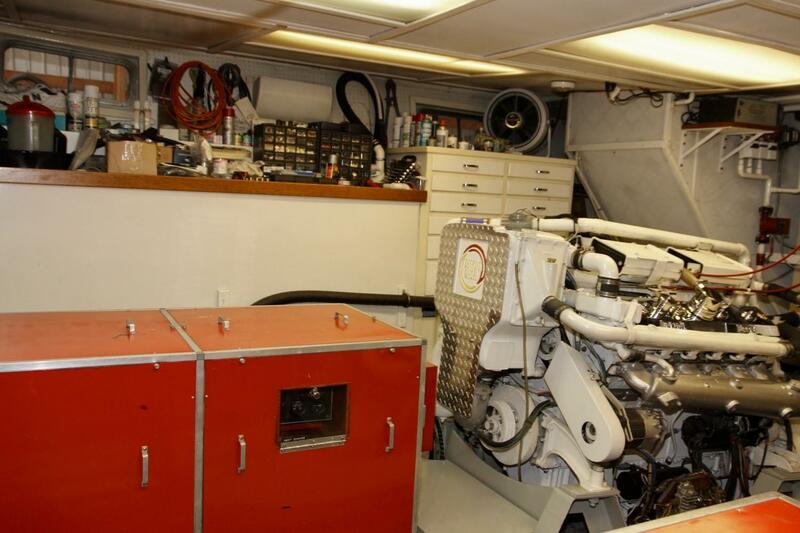 The first owners intelligently fitted the yacht with twin naturally aspirated 12 cylinder Detroit Diesel 12V71Ns, rather than 8 cylinder 8V71s with turbos and after coolers. 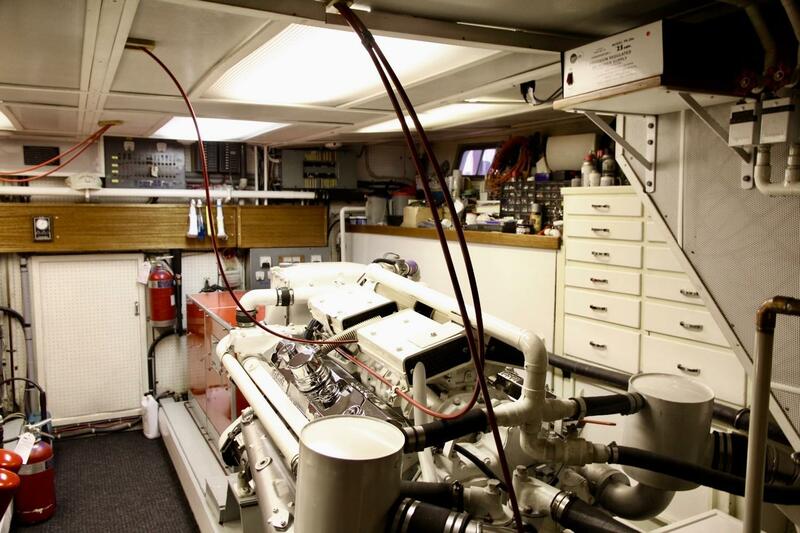 These 12V71s provide more torque at the lower end of the rpm range, meaning more power at lower rpms, and being naturally aspirated, they do not work as hard to provide similar horsepower. They last longer, are easier to maintain, and are actually quieter. 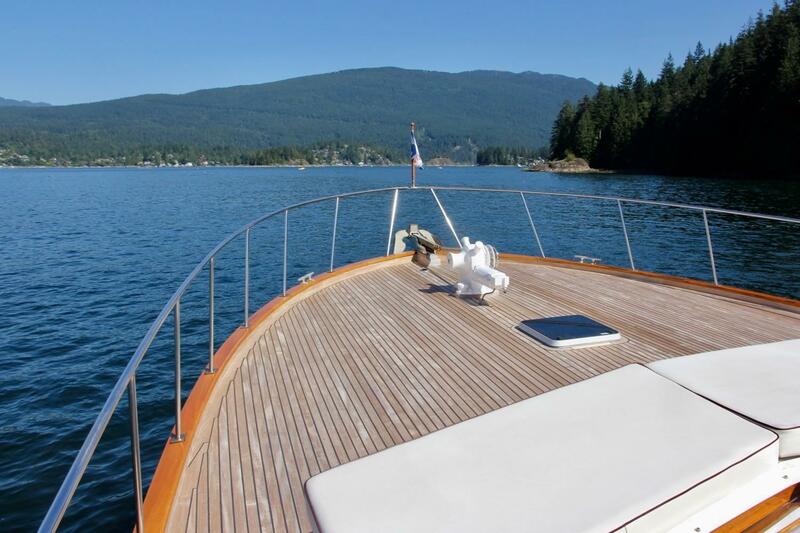 Eagle Rock II is a robust Thornton Grenfell creation, commissioned by a local Vancouver family. Constructink started at the Grenfell shipyard, and was completed at McQueen Boat Works. McQueen has long been associated with Ed Monk vessels, as so many Monks were built at the McQueen yard. 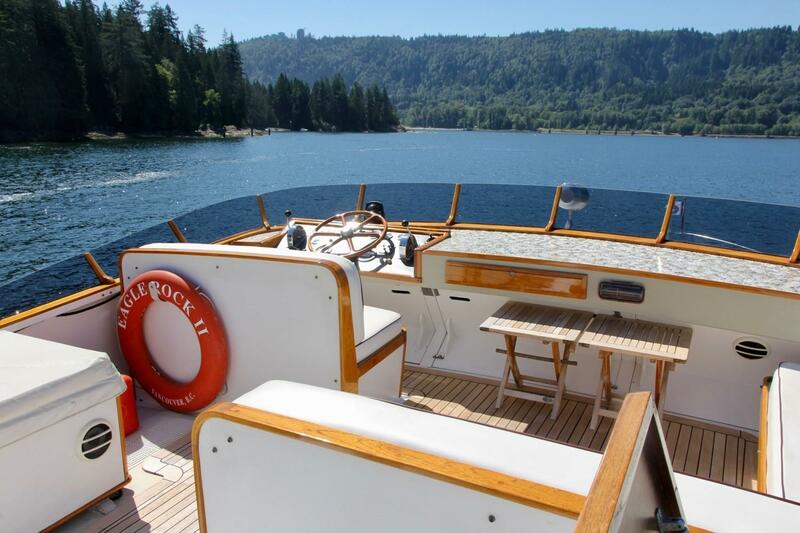 But, as much as we love and respect the venerable Monks, Eagle Rock II is much more heavily built. 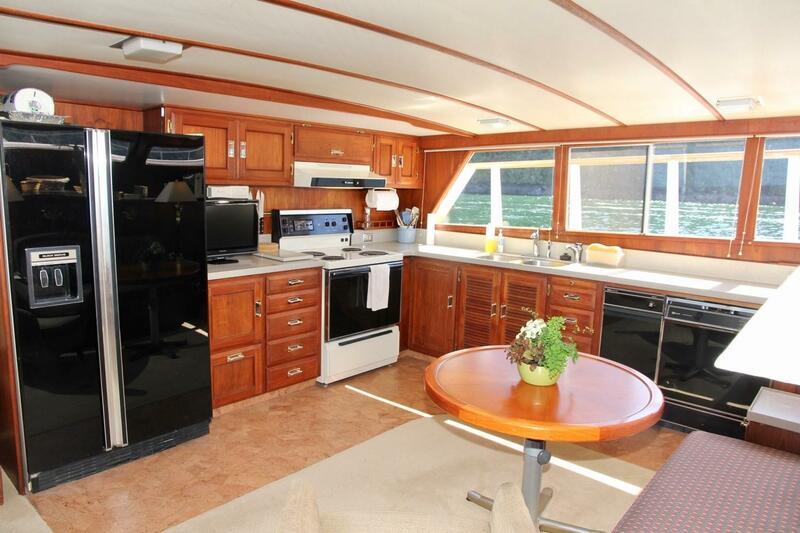 The 85' x 30' boat shed is offered separately, at $195,000 CAD. 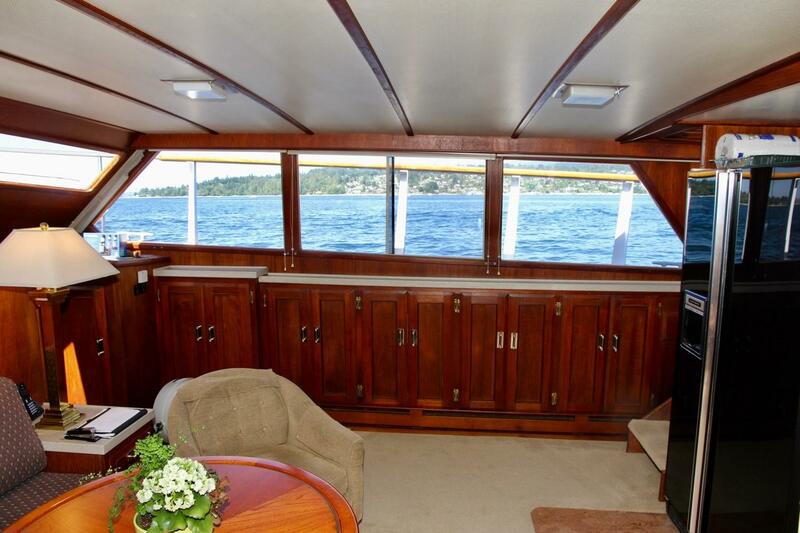 The owners would be far more receptive to an offer that included both the vessel and her shed. 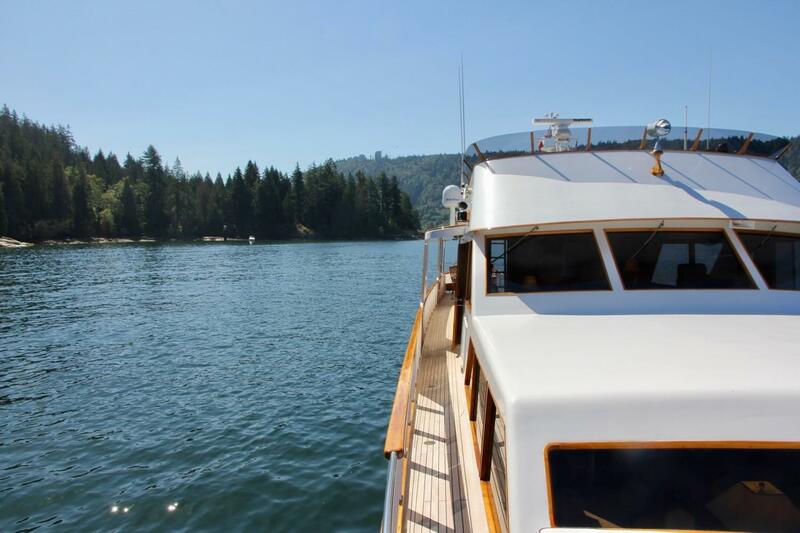 A boat shed is the best way to keep a vessel like Eagle Rock II in such fine condition, making maintenance far easier, trips to the shipyard less frequent, and preserving her long term value. One can posit that the shed becomes cost-efficient. Arguably, Eagle Rock lI's boat shed is as heavily built as the vessel. 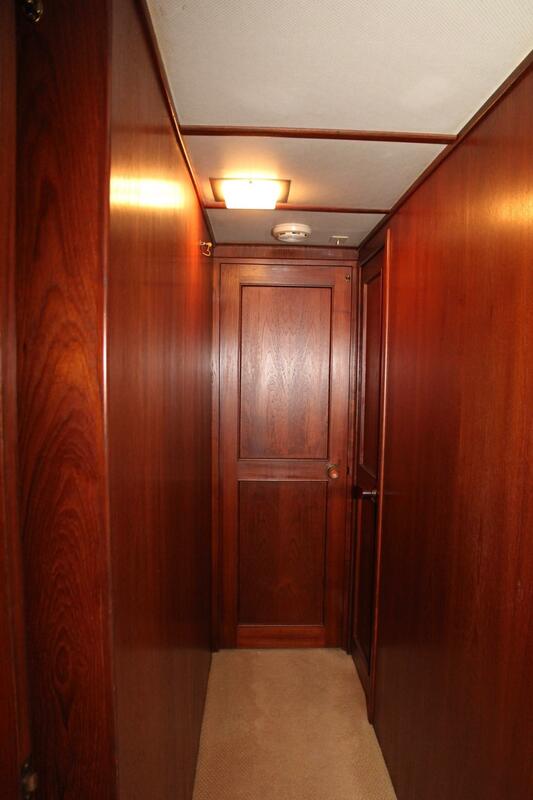 It was originally built for the Woodward's family to exacting standards. It is sitting on strong floatation, updated as needed. 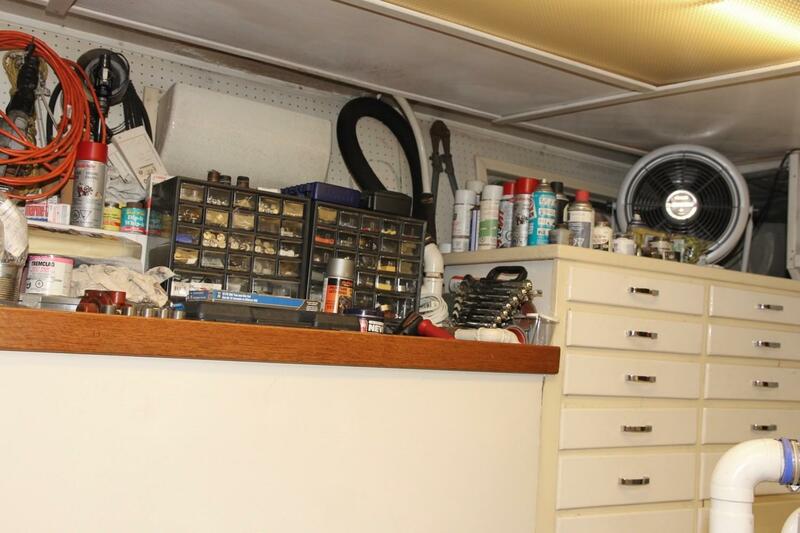 There is a work bench, and room for spares and other storage needs. 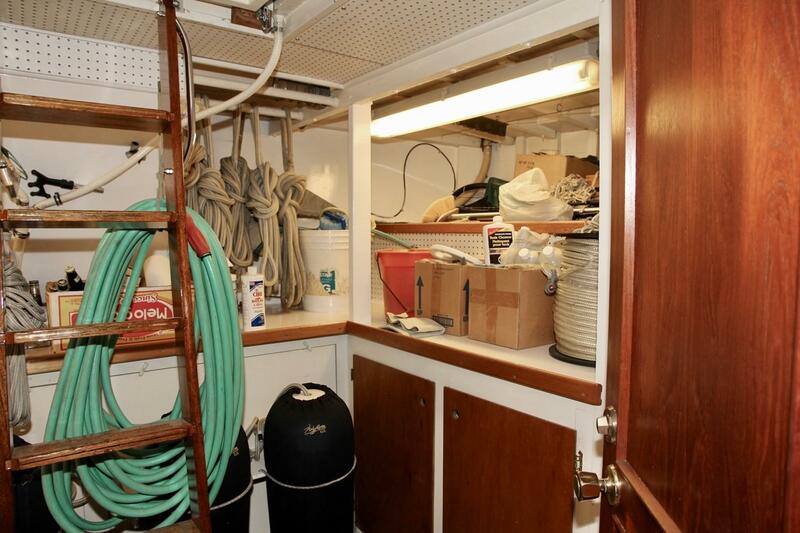 Items to be excluded from the sale include; the ship's bell, artwork, antiques, all personal gear, CDs, DVDs, charts, books, guides, and fishing equipment. There is a good inventory of tools and spare parts that are to be included in the sale. The name "Eagle Rock II" is to be reserved. 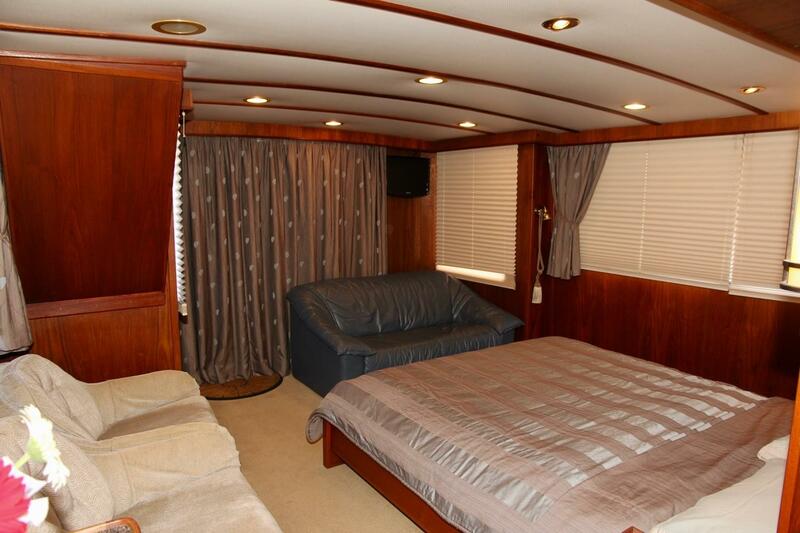 Hi there, I would like more information about the McQueen Grenfell 77 Motoryacht.